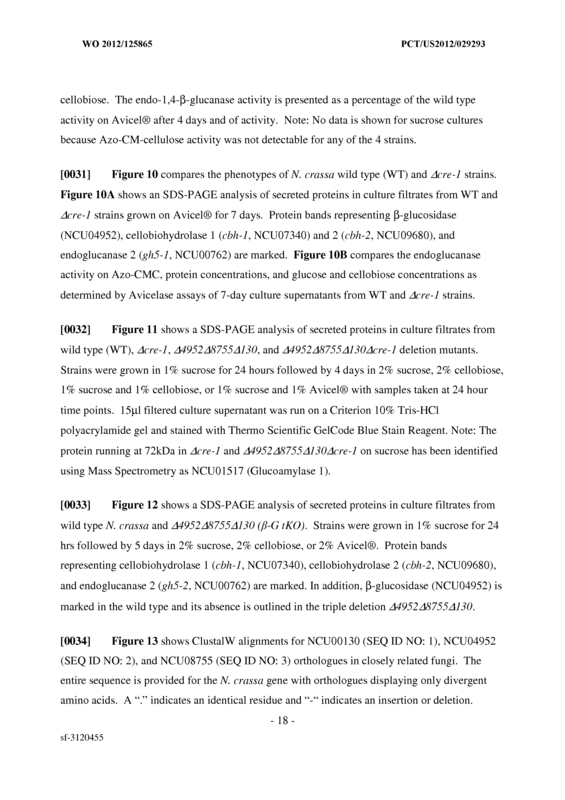 The present disclosure provides mutant cells for the secretion of proteins and for the degradation of lignocellulosic biomass. 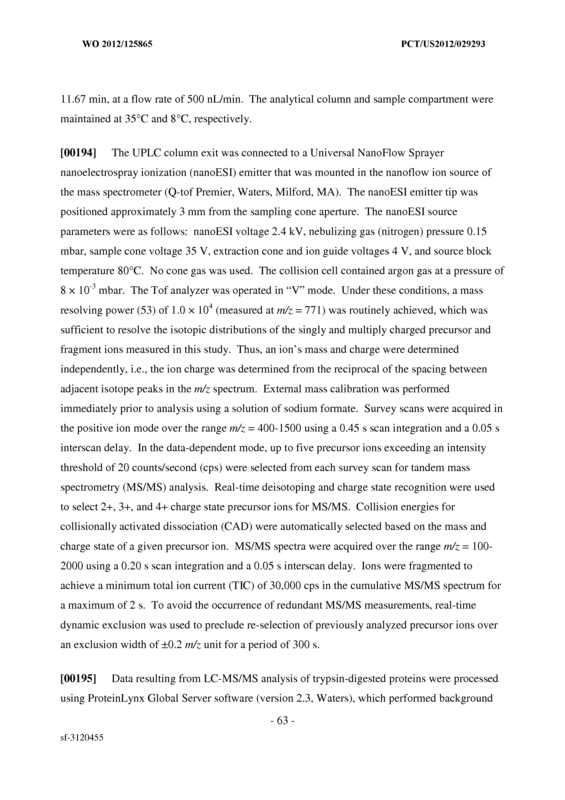 Methods for the use of these cells are also provided. 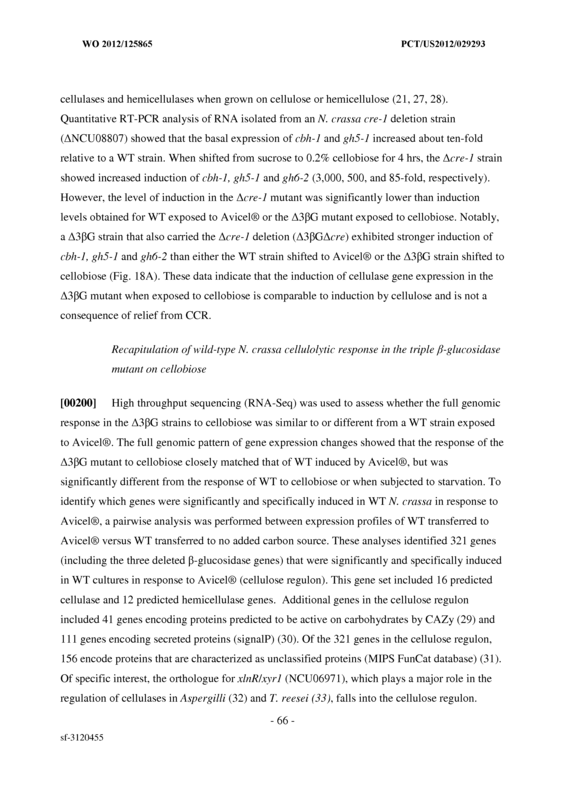 Specifically, the utility of combined genetic deletions of ß-glucosidases and the catabolite repressor gene creA/cre-1 for protein secretion in fungal and yeast cells is disclosed. 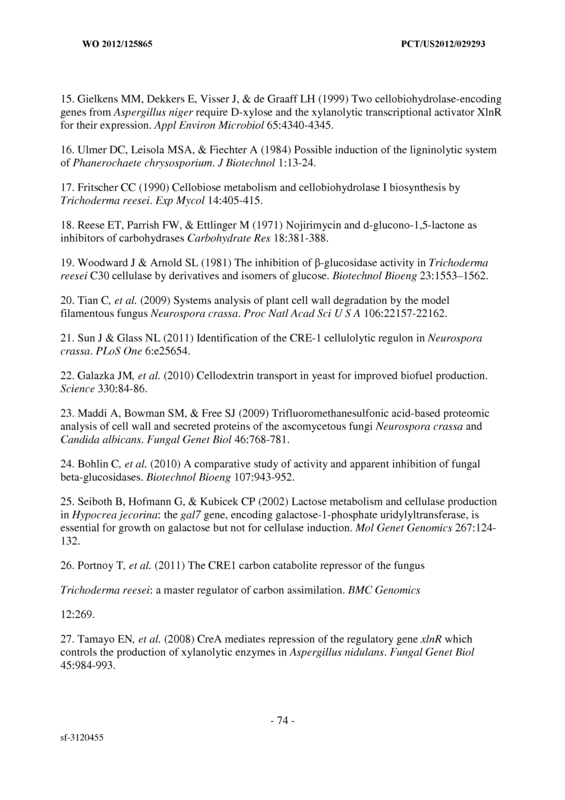 (b) contacting said mutant cell with cellulosic biomass, wherein said cellulosic biomass induces the mutant cell to secrete said protein. 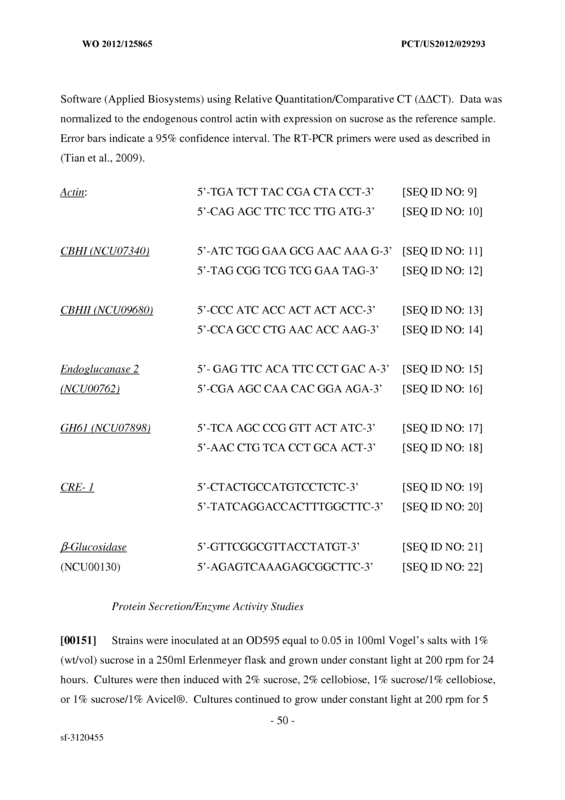 mutation in a cre-1 gene in said cell. 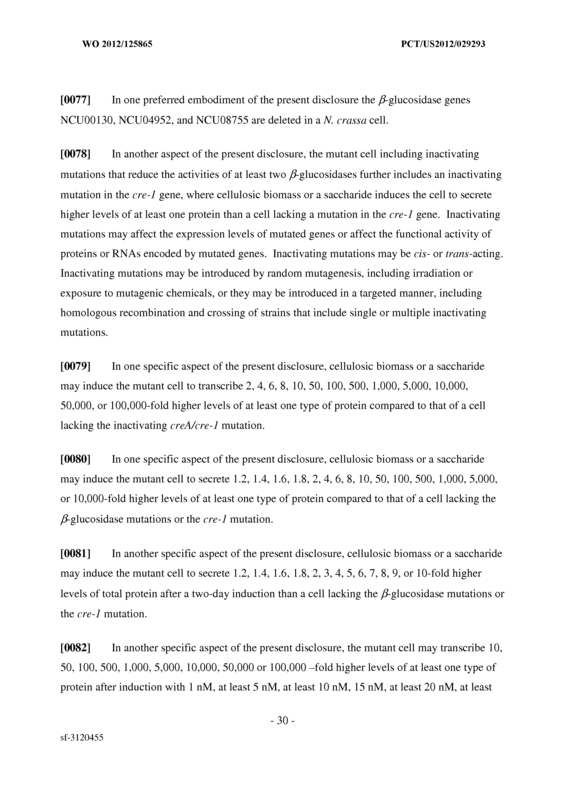 The method of claim 3, wherein the mutant cell further comprises inactivating mutations in two or more β-glucosidase genes. 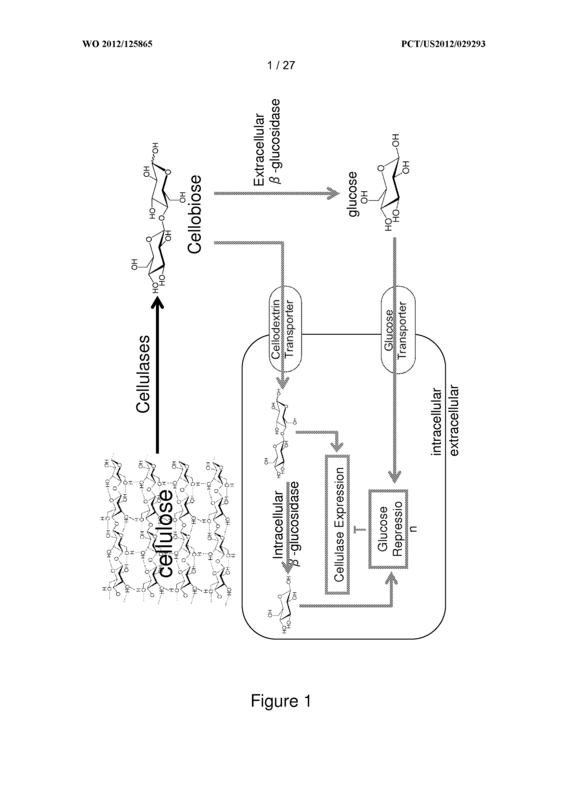 The method of any one of claims 1-4, wherein the cellulosic biomass comprises one or more of a polysaccharide, an oligosaccharide, cellulose, microcrystalline cellulose, cellodextrin, cellobiose, cellotriose, cellotetraose, cellopentose, and cellohexose. 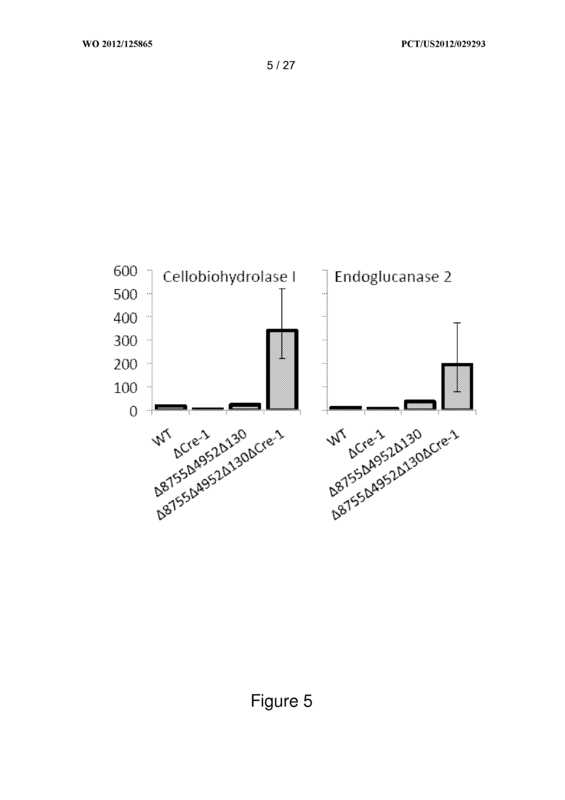 - 77 - sf-3120455 (b) contacting said mutant cell with a saccharide, wherein said saccharide induces the mutant cell to secrete said protein. 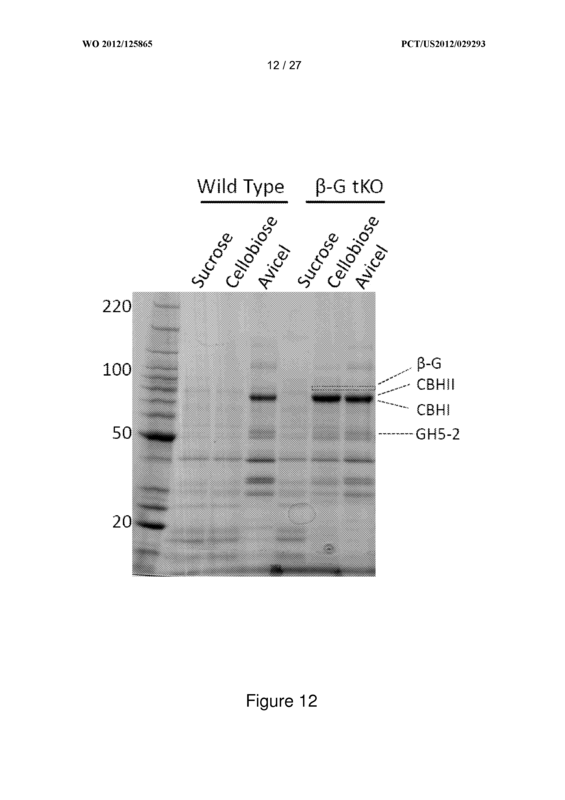 (b) contacting said mutant cell with a saccharide, wherein said saccharide induces the mutant cell to secrete said protein. 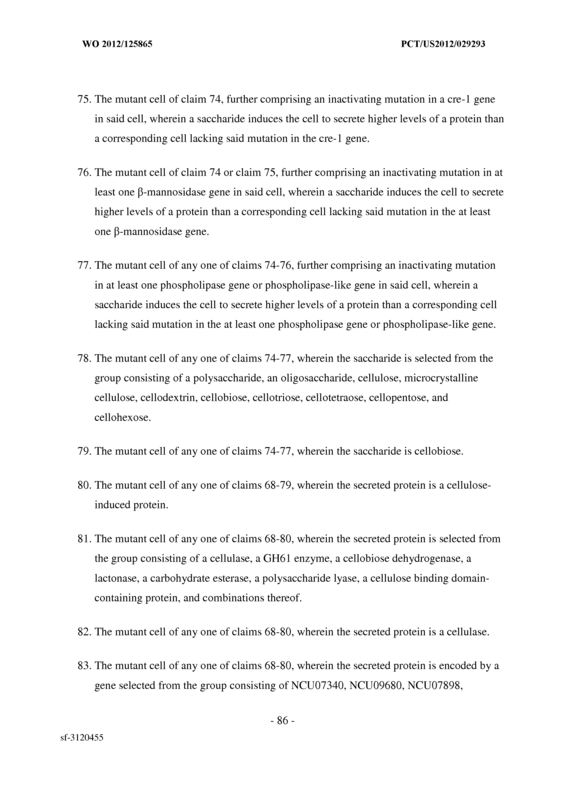 The method of claim 9, wherein the mutant cell further comprises inactivating mutations in two or more β-glucosidase genes. 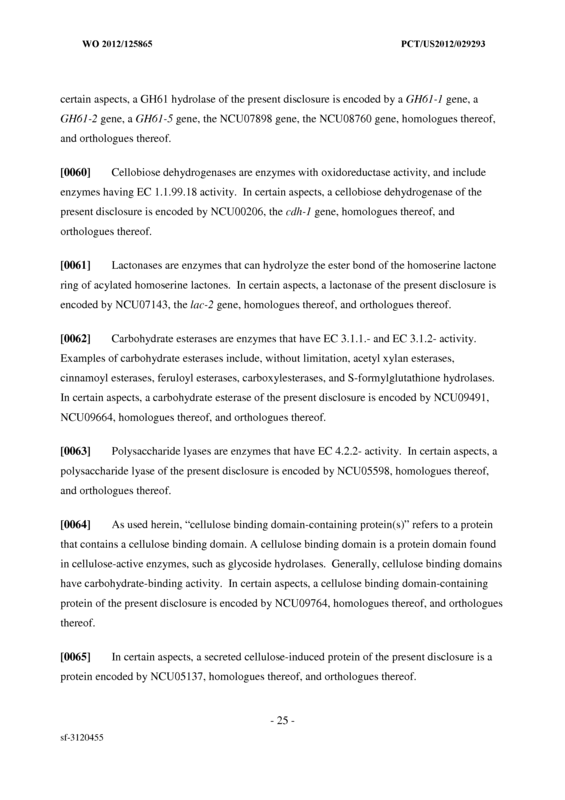 The method of any one of claims 7-10, wherein the saccharide is selected from the group consisting of a polysaccharide, an oligosaccharide, cellulose, microcrystalline cellulose, cellodextrin, cellobiose, cellotriose, cellotetraose, cellopentose, and cellohexose. 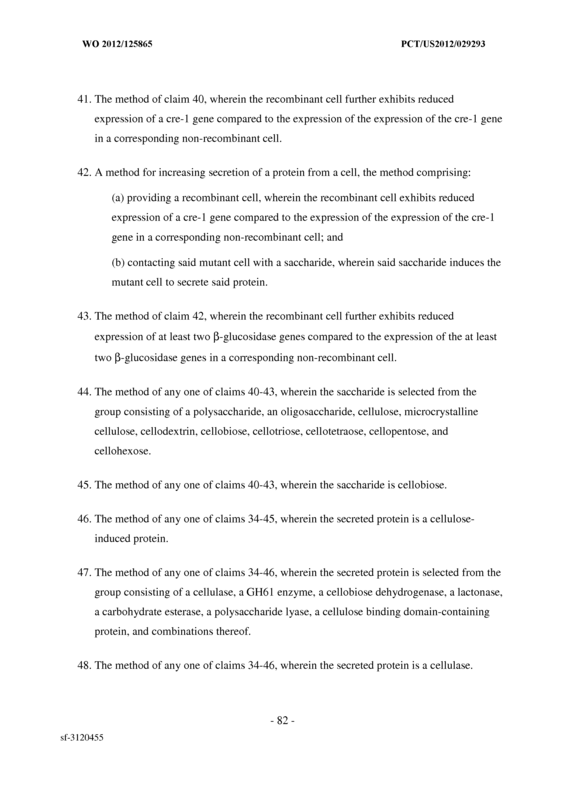 The method of any one of claims 7-10, wherein the saccharide is cellobiose. 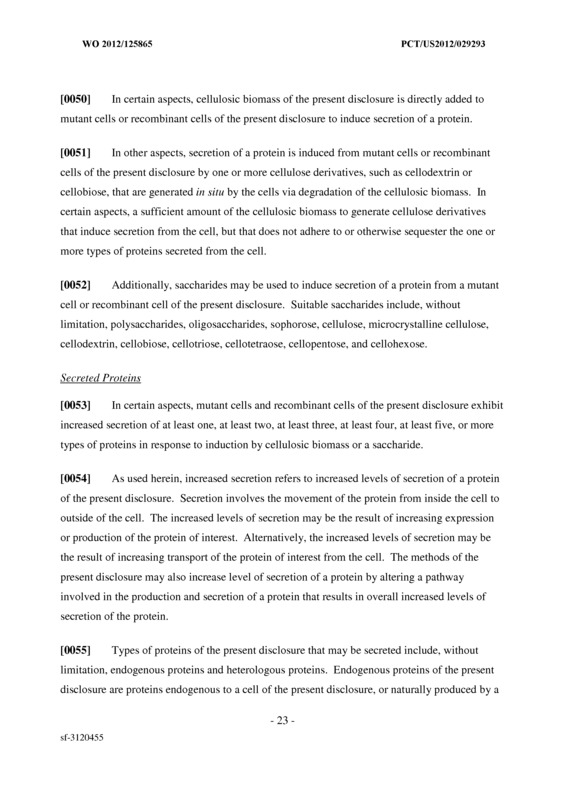 The method of any one of claims 1-12, wherein the secreted protein is a cellulose- induced protein. 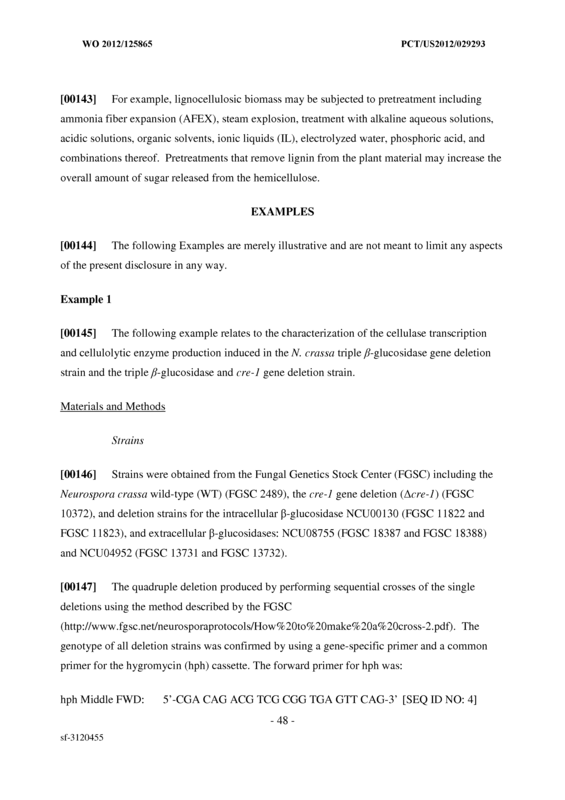 The method of any one of claims 1-13, wherein the secreted protein is selected from the group consisting of a cellulase, a GH61 enzyme, a cellobiose dehydrogenase, a lactonase, a carbohydrate esterase, a polysaccharide lyase, a cellulose binding domain-containing protein, and combinations thereof. 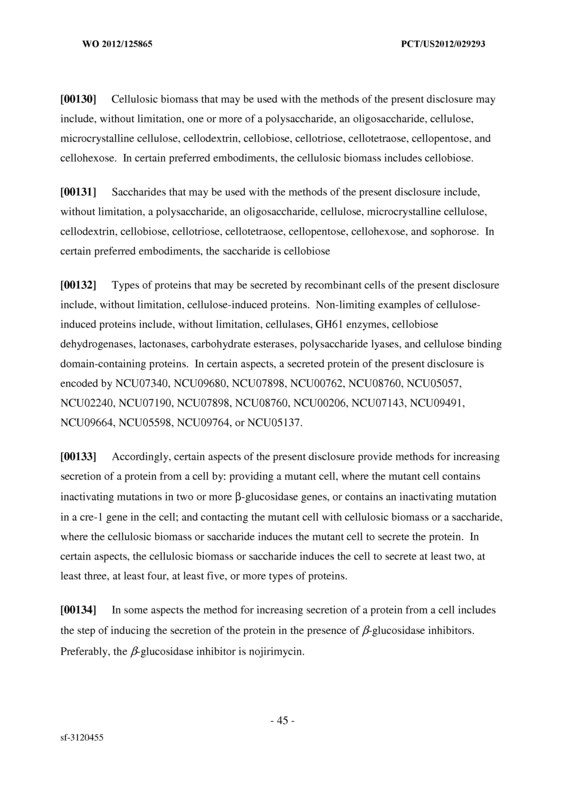 The method of any one of claims 1-13, wherein the secreted protein is a cellulase. 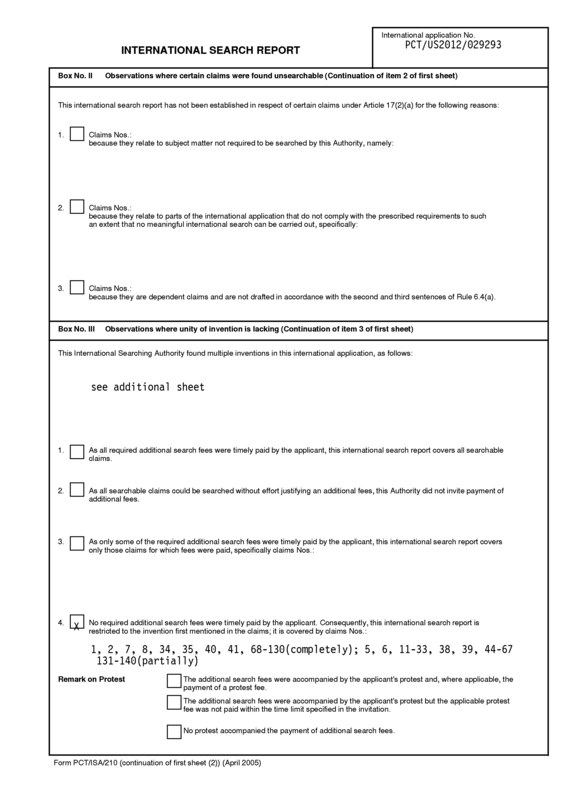 - 78 - sf-3120455 NCU08760, NCU05057, NCU02240, NCU07190, NCU07898, NCU08760, NCU00206, NCU07143, NCU09491, NCU09664, NCU05598, NCU09764, and NCU05137. 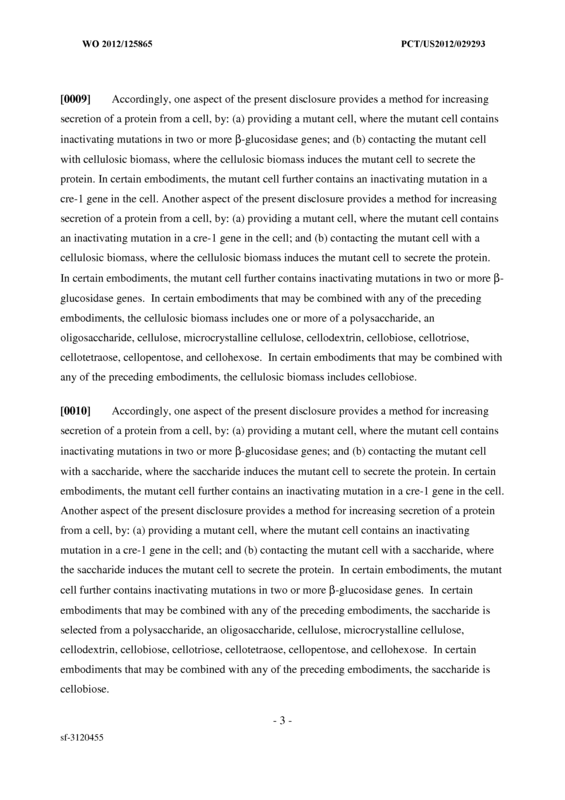 The method of any one of claims 1-16, wherein the mutant cell further comprises an inactivating mutation in at least one β-mannosidase gene in said cell. 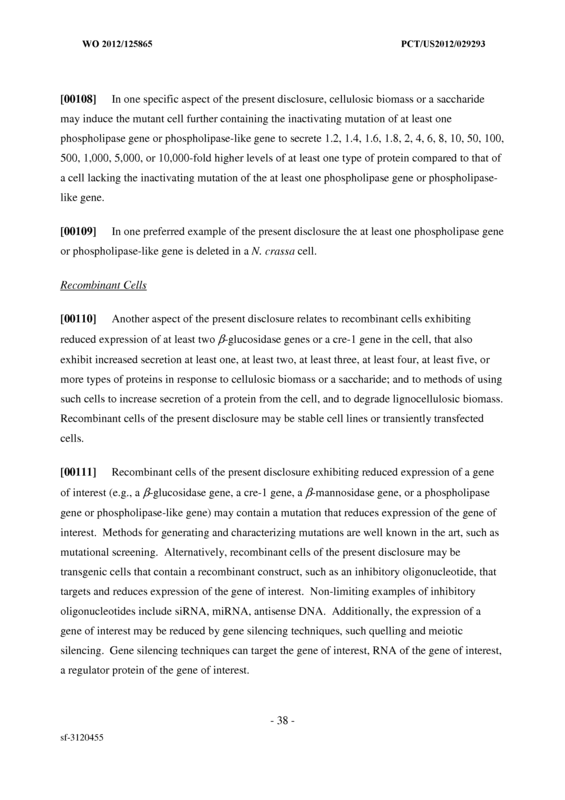 The method of any one of claims 1-17, wherein the mutant cell further comprises an inactivating mutation in at least one phospholipase gene or phospholipase-like gene in said cell. 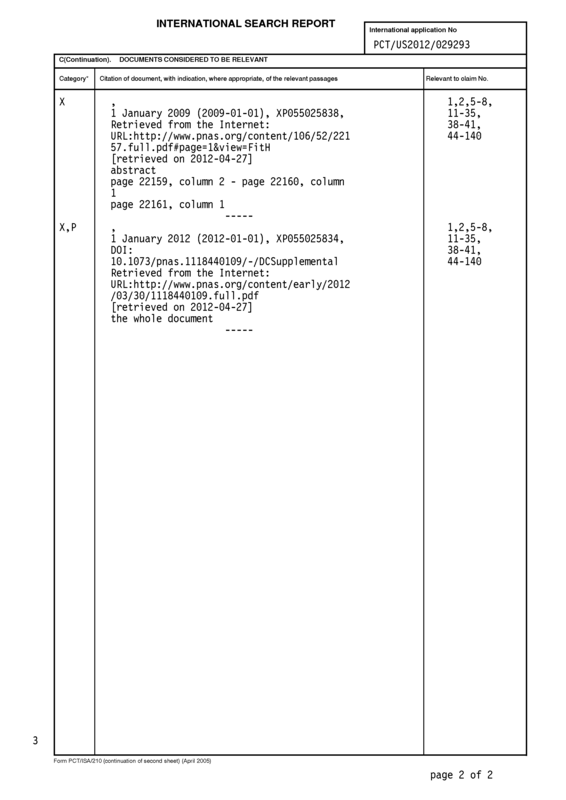 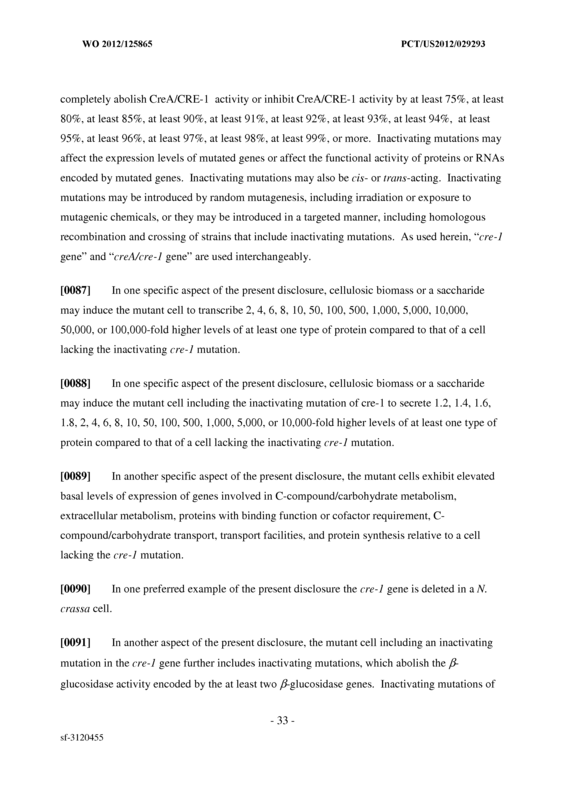 The method of any one of claims 1-18, wherein the inactivating mutations are deletions. 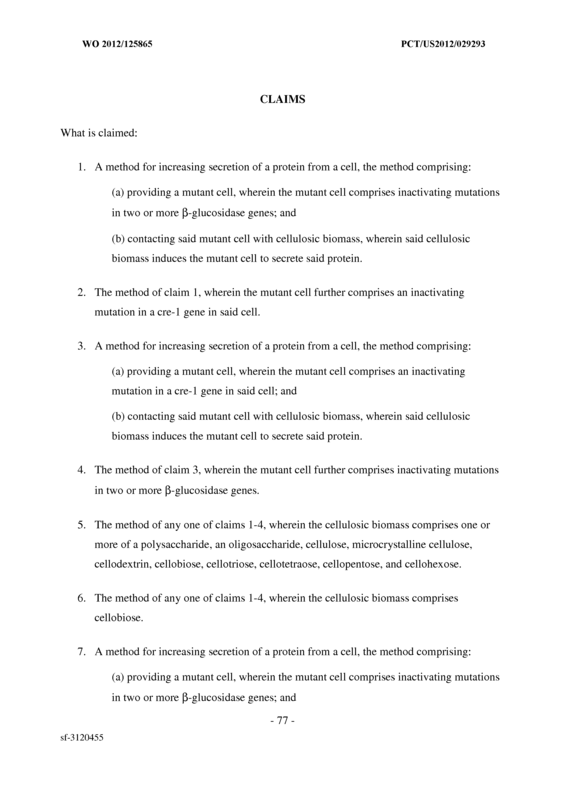 The method of any one of claims 1-19, wherein the cell is a recombinant cell. 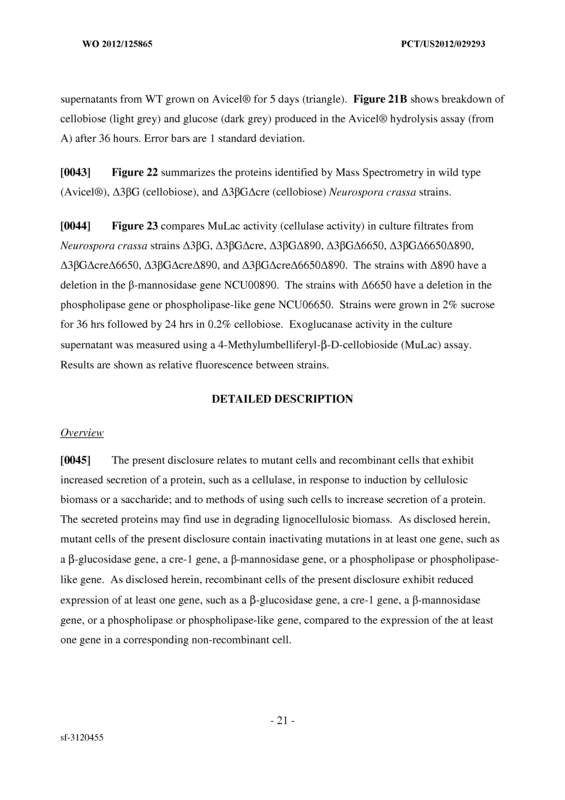 The method of any one of claims 1-20, wherein the cell is a fungal or yeast cell. 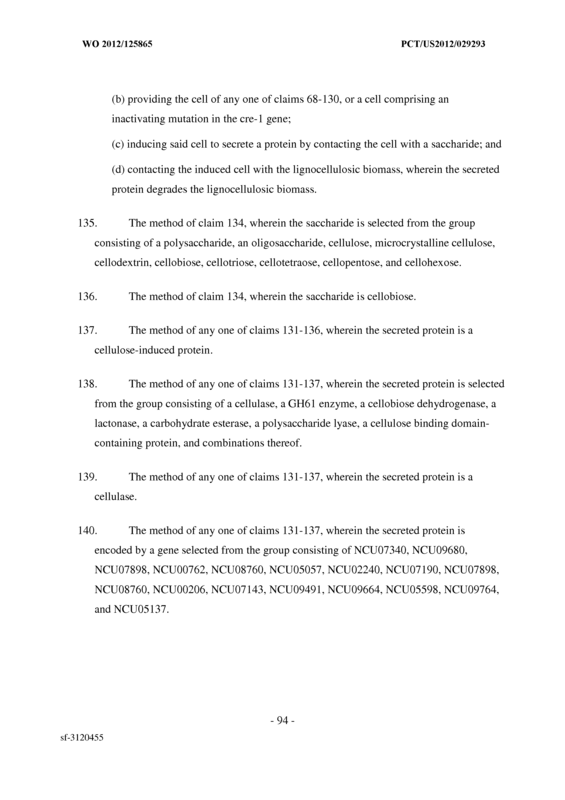 The method of any one of claims 1-21, wherein the cell is a filamentous fungus of the ascomycete or basidiomycete species. 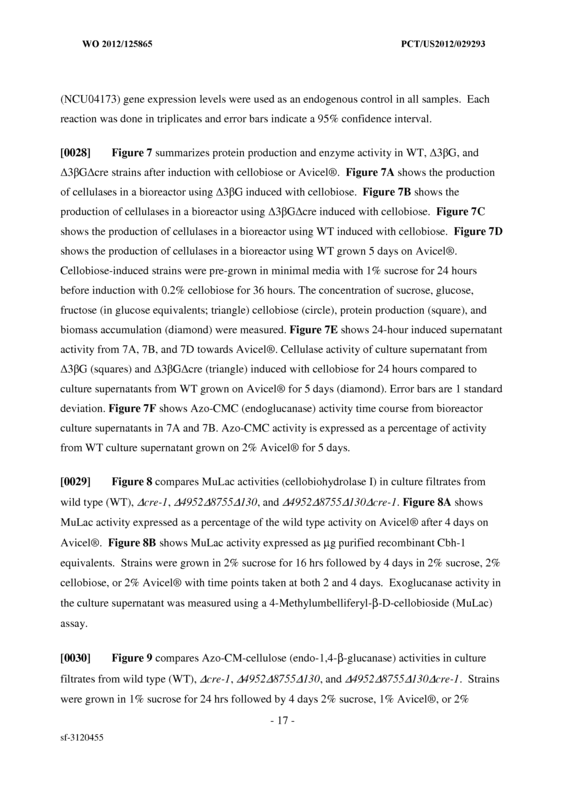 Trichoderma reesei cells, Phanerochaete chrysosporium cells, Sporotrichum thermophile (Myceliophthora thermophila) cells, Gibber ella zeae cells, Sclerotinia sclerotiorum cells, Botryotinia fucke liana cells, Aspergillus niger cells, Penicillium chrysogenum cells, Schizophyllum commune cells, Postia placenta cells, Aspergillus oryzae cells, and Acremonium cellulolyticus cells. 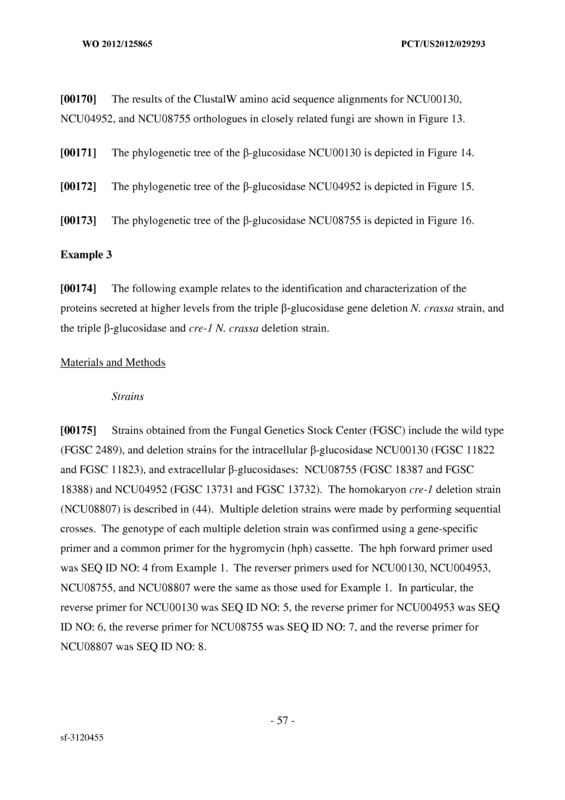 The method of any one of claims 1-23, wherein the two or more β-glucosidase genes are three or more β-glucosidase genes. 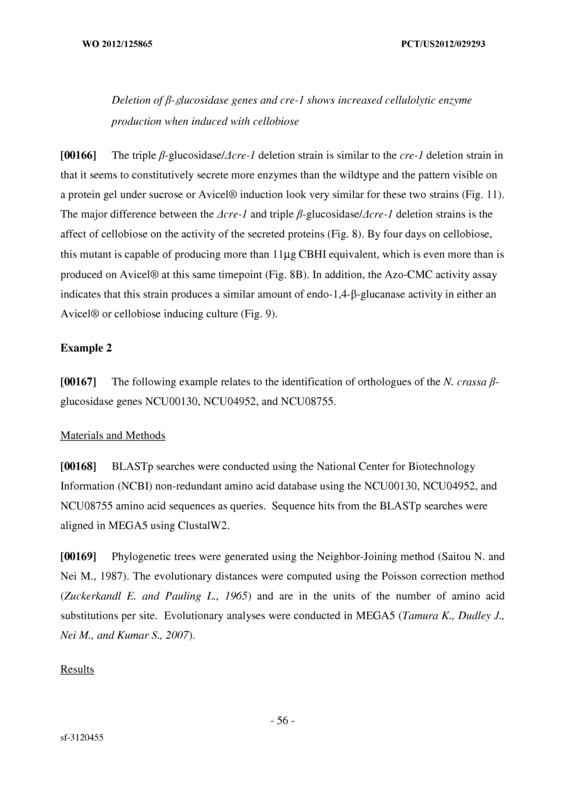 The method of any one of claims 1-23, wherein the two or more β-glucosidase genes are four or more β-glucosidase genes. 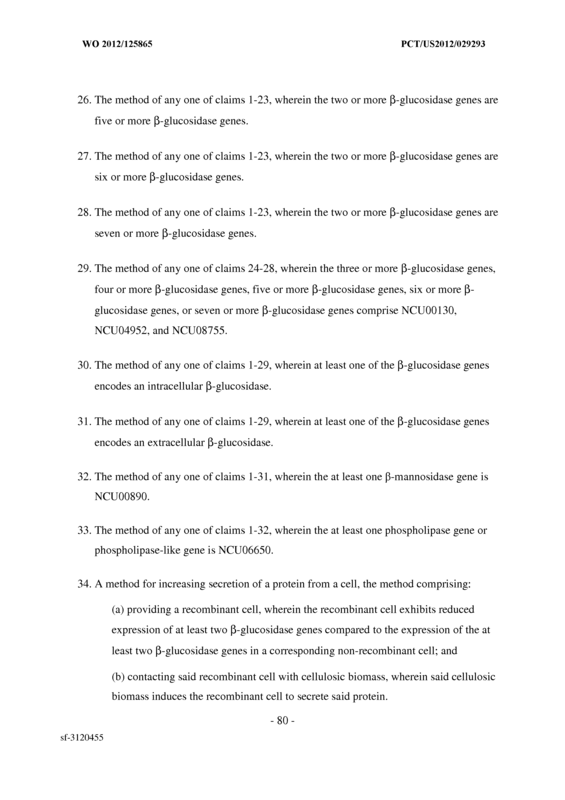 The method of any one of claims 1-23, wherein the two or more β-glucosidase genes are five or more β-glucosidase genes. 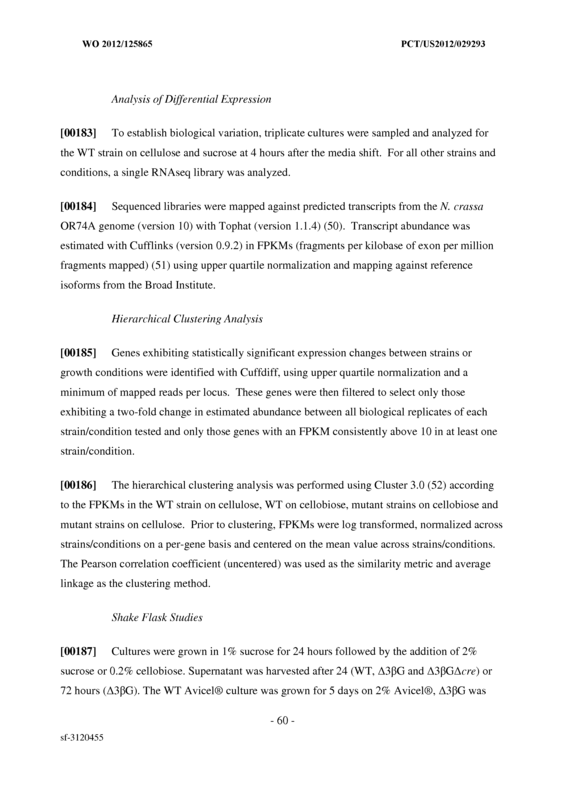 The method of any one of claims 1-23, wherein the two or more β-glucosidase genes are six or more β-glucosidase genes. 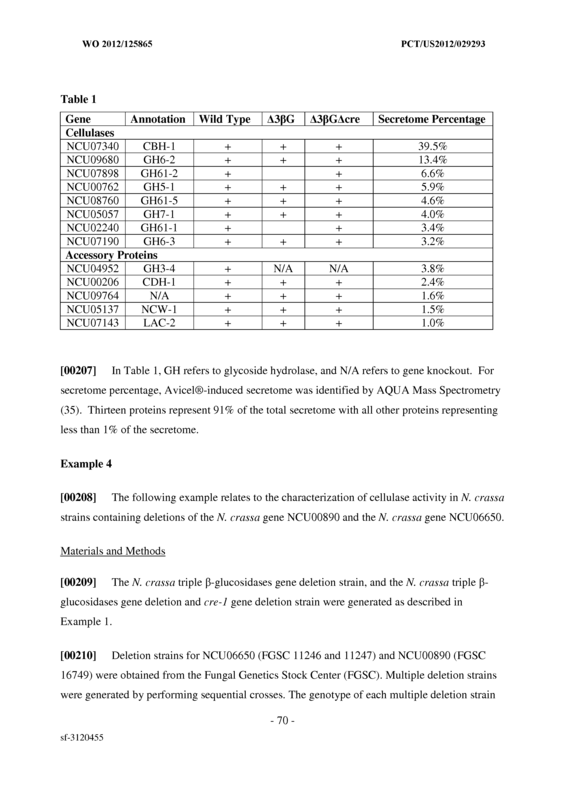 The method of any one of claims 1-23, wherein the two or more β-glucosidase genes are seven or more β-glucosidase genes. 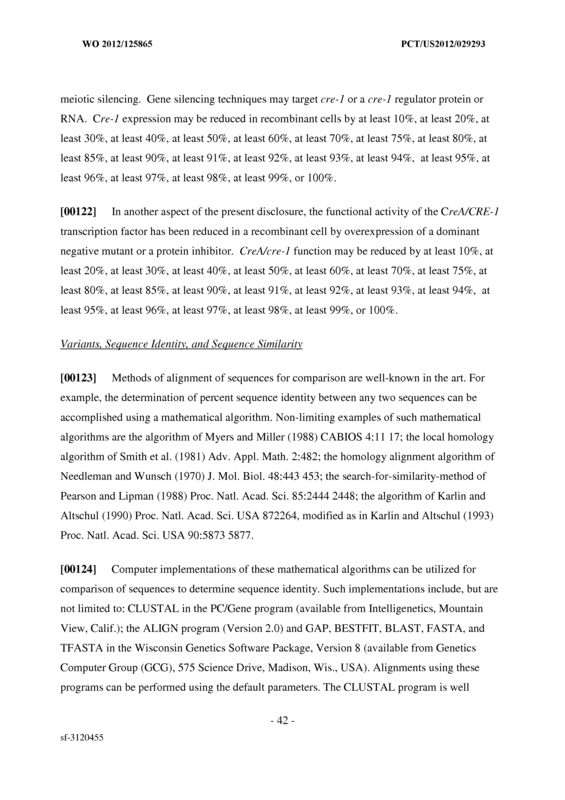 The method of any one of claims 24-28, wherein the three or more β-glucosidase genes, four or more β-glucosidase genes, five or more β-glucosidase genes, six or more β- glucosidase genes, or seven or more β-glucosidase genes comprise NCU00130, NCU04952, and NCU08755. 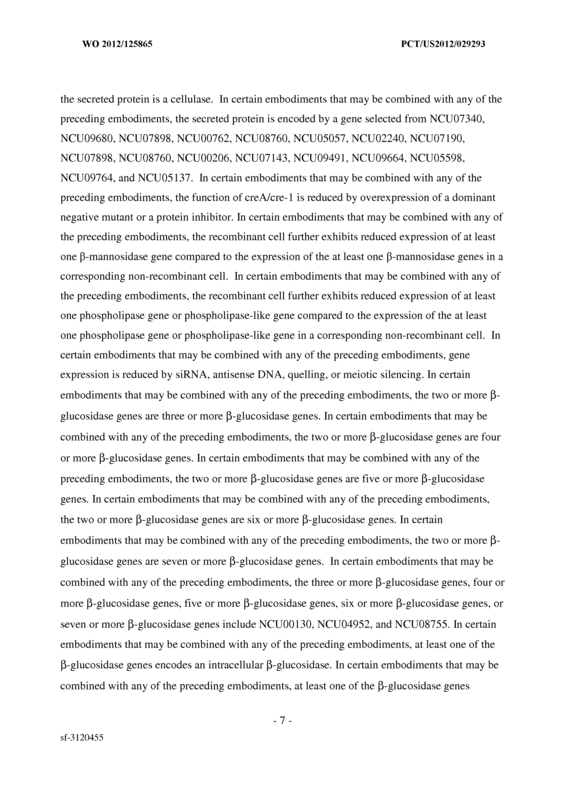 The method of any one of claims 1-29, wherein at least one of the β-glucosidase genes encodes an intracellular β-glucosidase. 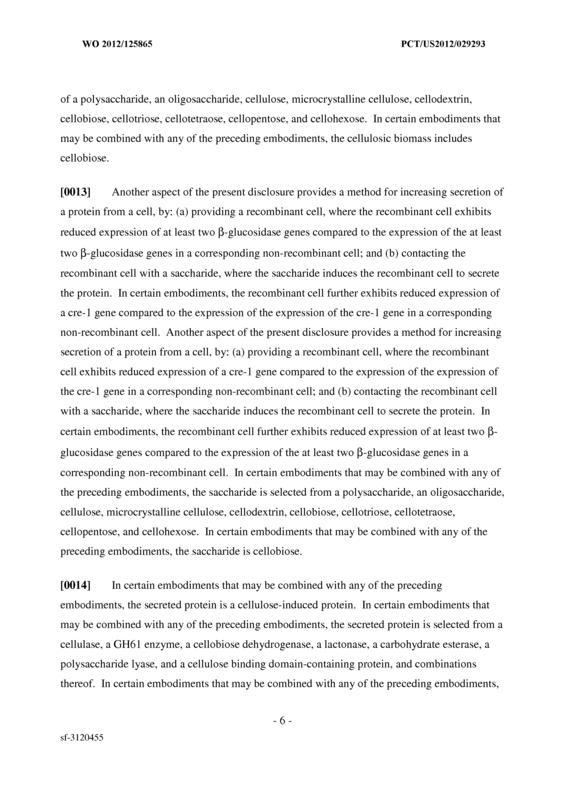 The method of any one of claims 1-29, wherein at least one of the β-glucosidase genes encodes an extracellular β-glucosidase. 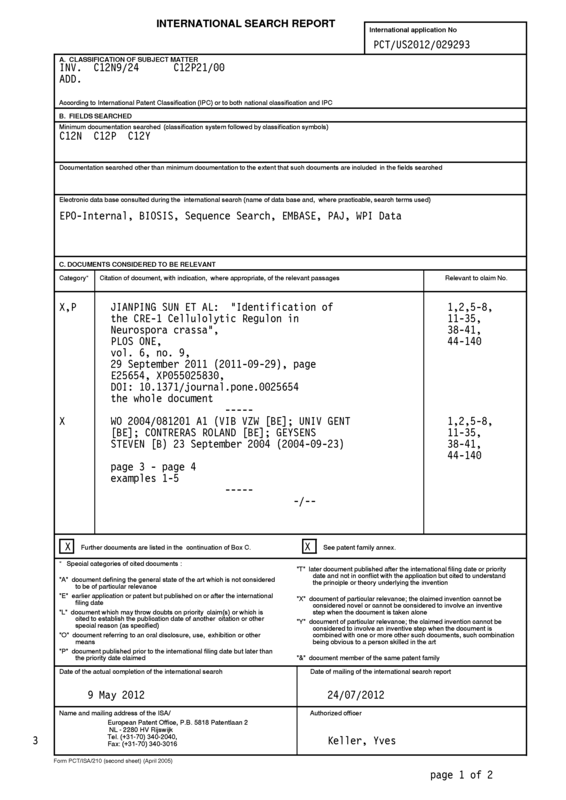 The method of any one of claims 1-31, wherein the at least one β-mannosidase gene is NCU00890. 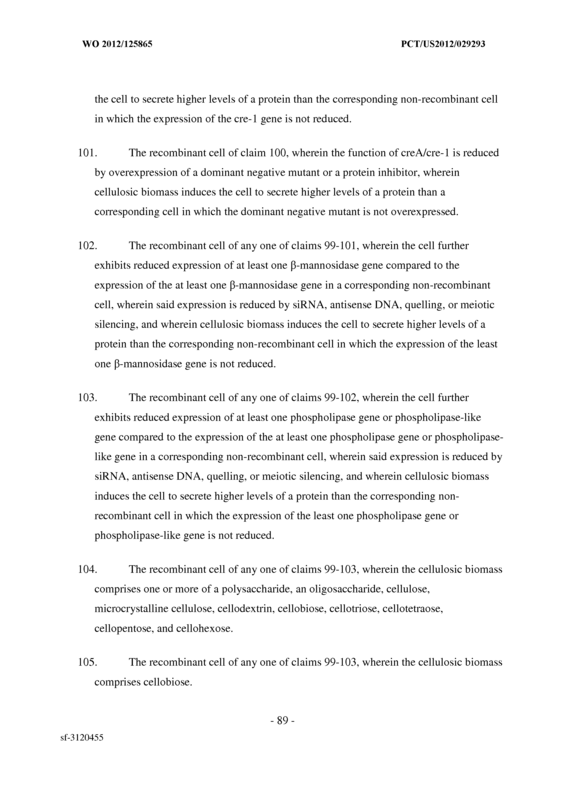 The method of any one of claims 1-32, wherein the at least one phospholipase gene or phospholipase-like gene is NCU06650. 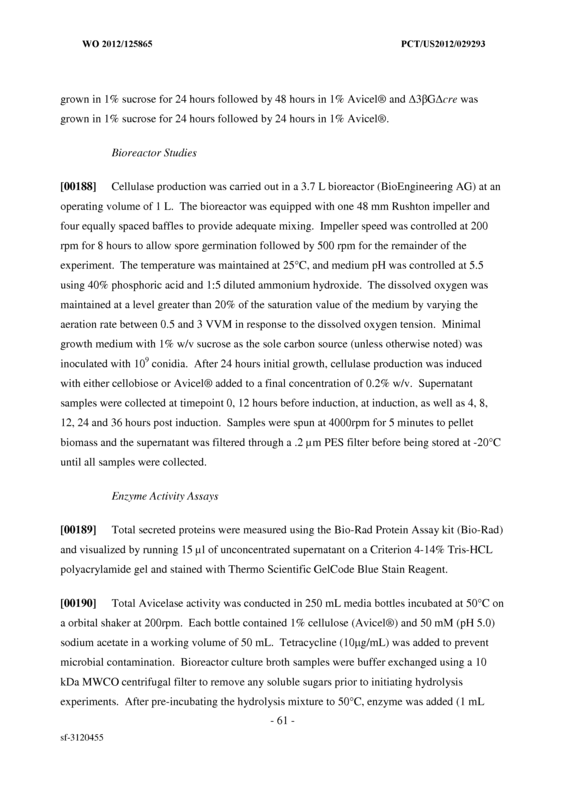 (b) contacting said recombinant cell with cellulosic biomass, wherein said cellulosic biomass induces the recombinant cell to secrete said protein. 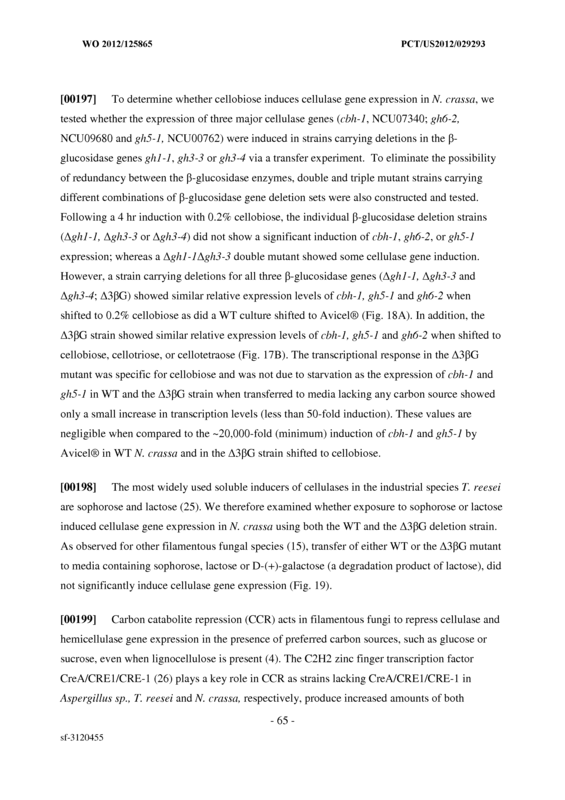 The method of claim 34, wherein the recombinant cell further exhibits reduced expression of a cre-1 gene compared to the expression of the expression of the cre-1 gene in a corresponding non-recombinant cell. 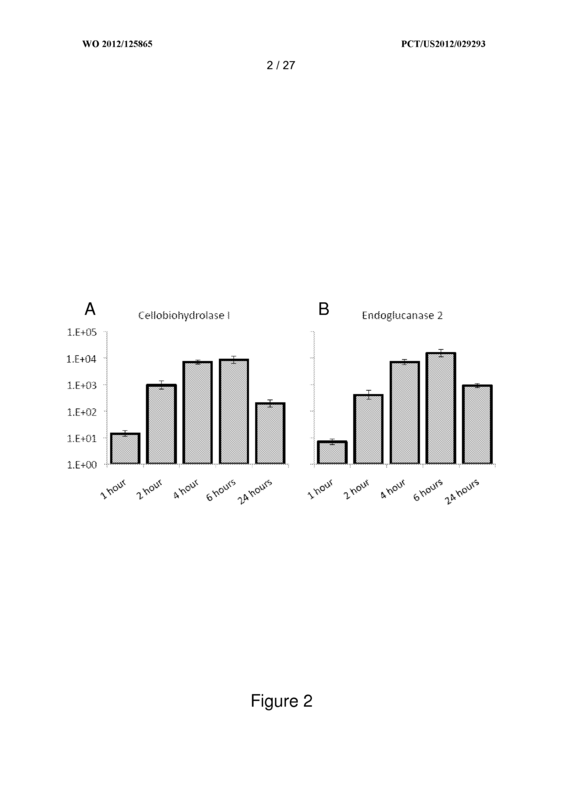 expression of at least two β-glucosidase genes compared to the expression of the at least two β-glucosidase genes in a corresponding non-recombinant cell. 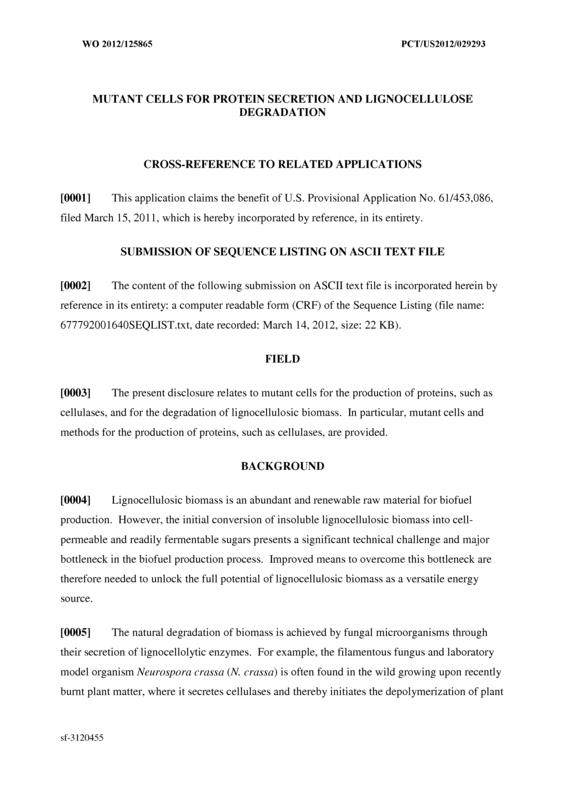 The method of any one of claims 34-37, wherein the cellulosic biomass comprises one or more of a polysaccharide, an oligosaccharide, cellulose, microcrystalline cellulose, cellodextrin, cellobiose, cellotriose, cellotetraose, cellopentose, and cellohexose. 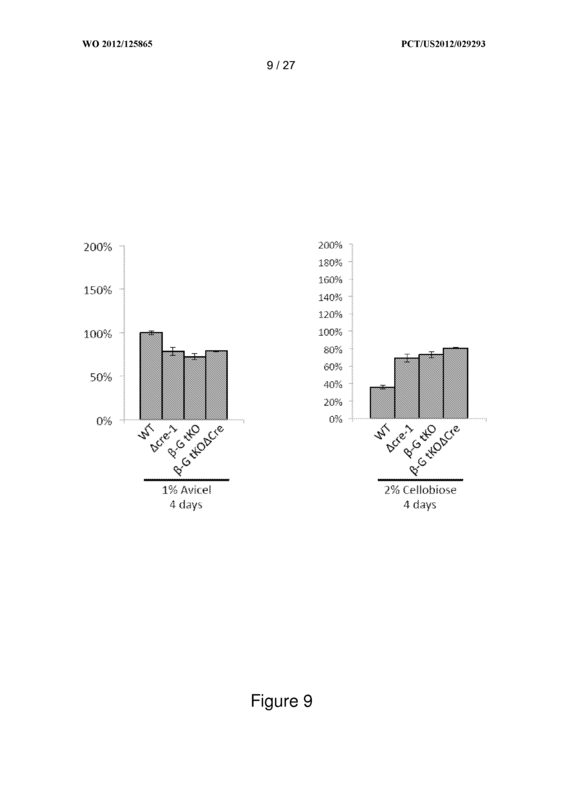 The method of claim 40, wherein the recombinant cell further exhibits reduced expression of a cre-1 gene compared to the expression of the expression of the cre-1 gene in a corresponding non-recombinant cell. 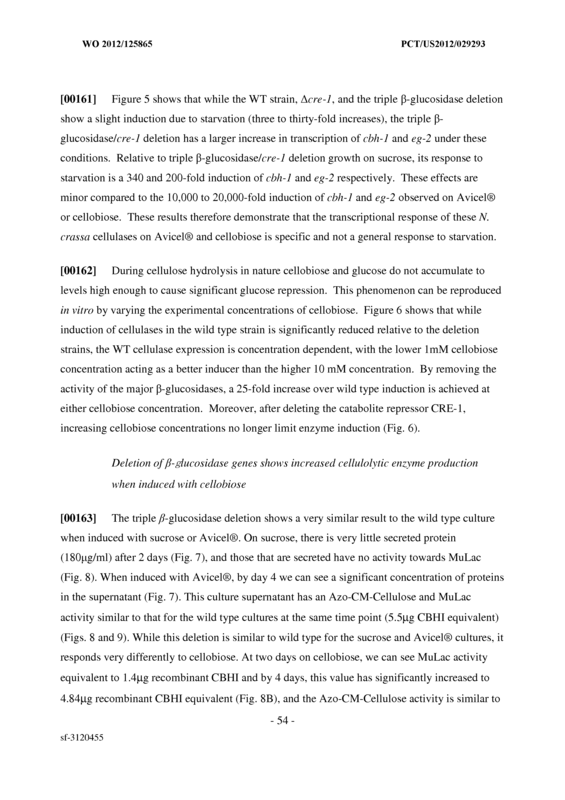 The method of any one of claims 40-43, wherein the saccharide is cellobiose. 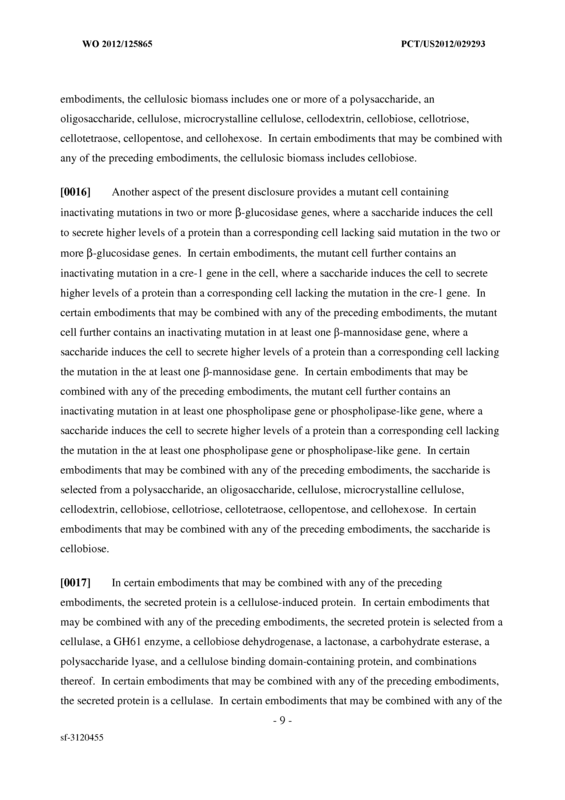 The method of any one of claims 34-45, wherein the secreted protein is a cellulose- induced protein. 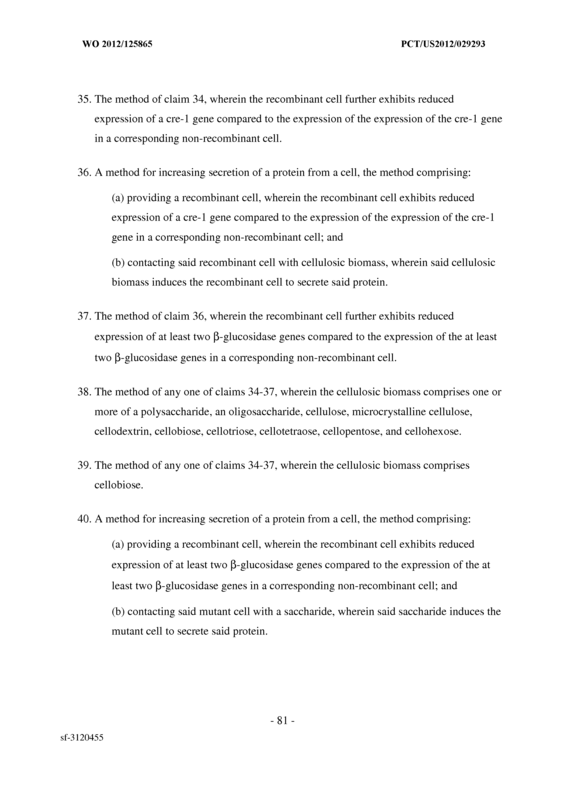 The method of any one of claims 34-46, wherein the secreted protein is selected from the group consisting of a cellulase, a GH61 enzyme, a cellobiose dehydrogenase, a lactonase, a carbohydrate esterase, a polysaccharide lyase, a cellulose binding domain-containing protein, and combinations thereof. 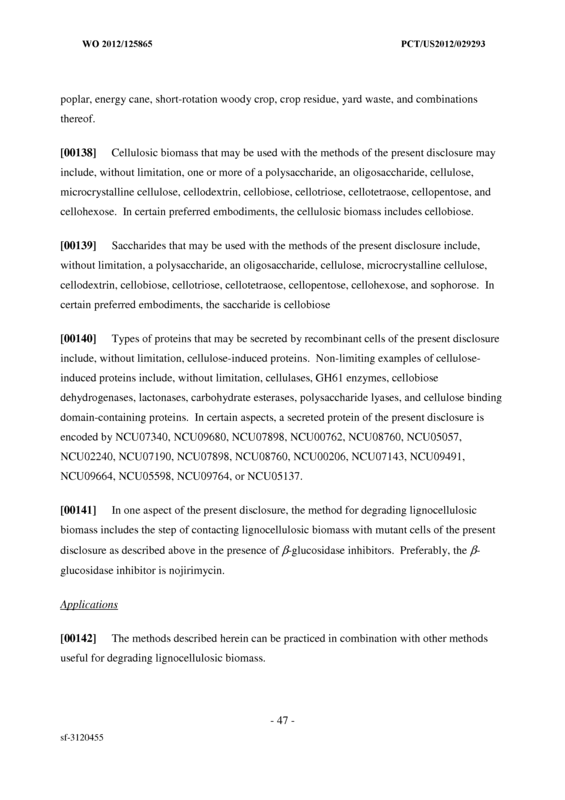 The method of any one of claims 34-46, wherein the secreted protein is a cellulase. 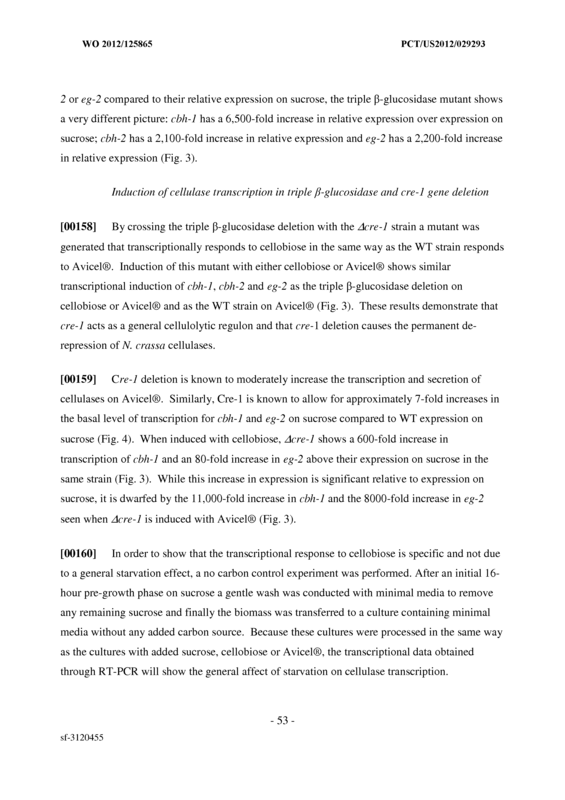 The method of any one of claims 34-49, wherein the function of creA/cre-1 is reduced by overexpression of a dominant negative mutant or a protein inhibitor. 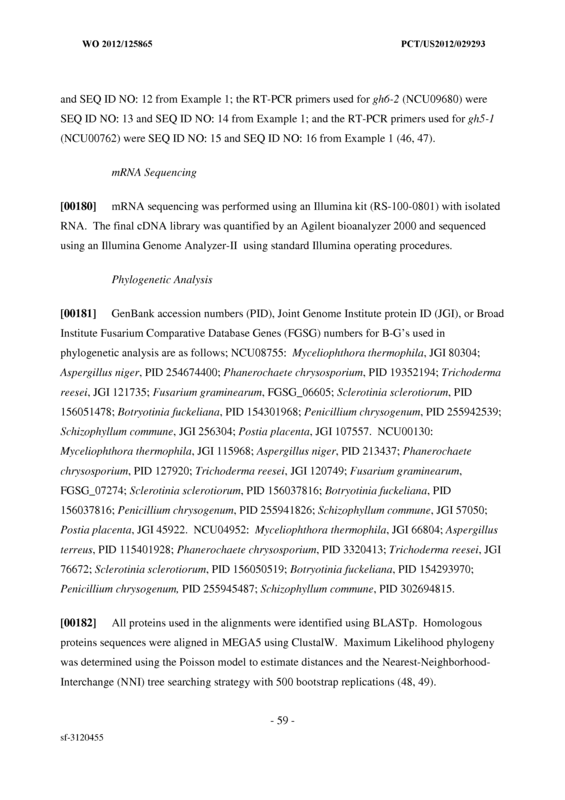 The method of any one of claims 34-50, wherein the recombinant cell further exhibits reduced expression of at least one β-mannosidase gene compared to the expression of the at least one β-mannosidase genes in a corresponding non-recombinant cell. 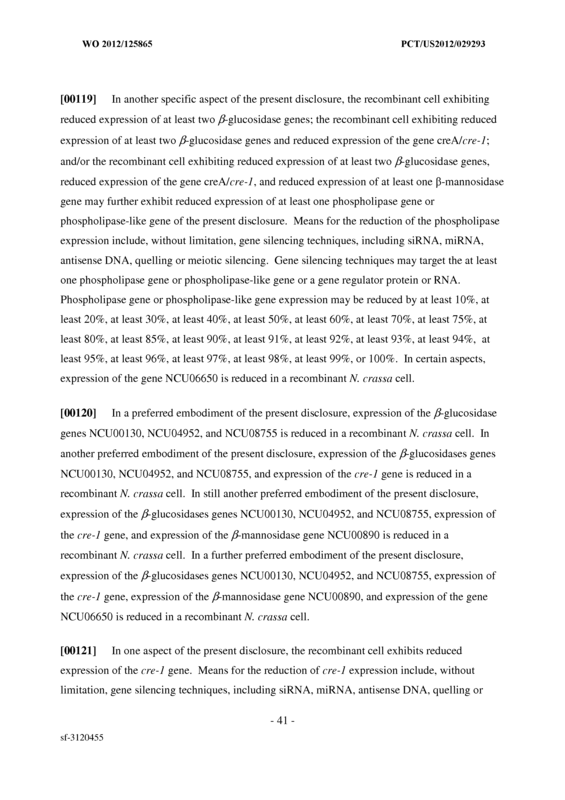 The method of any one of claims 34-51, wherein the recombinant cell further exhibits reduced expression of at least one phospholipase gene or phospholipase-like gene compared to the expression of the at least one phospholipase gene or phospholipase-like gene in a corresponding non-recombinant cell. 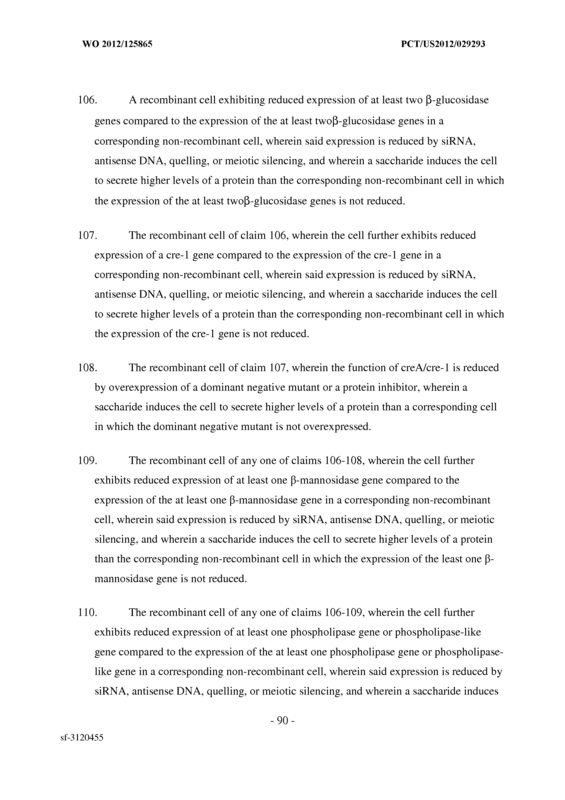 The method of any one of claims 34-52, wherein gene expression is reduced by siRNA, antisense DNA, quelling, or meiotic silencing. 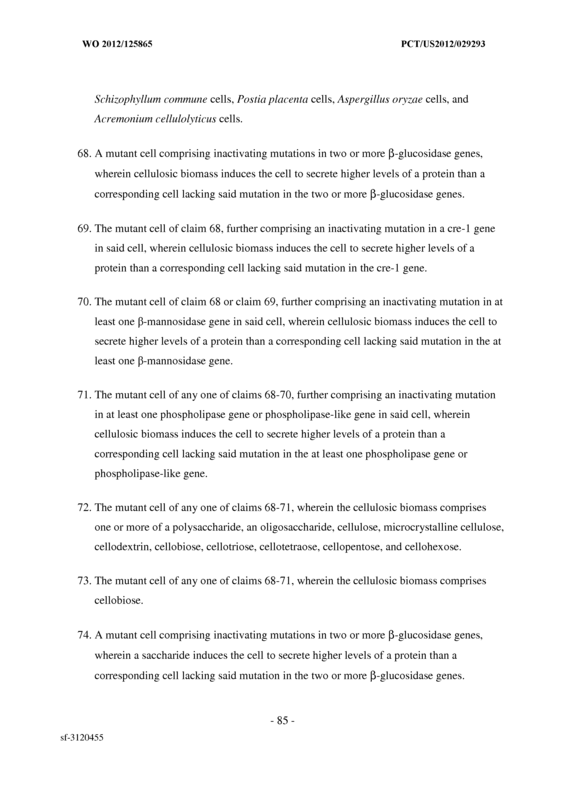 The method of any one of claims 34-53, wherein the two or more β-glucosidase genes are three or more β-glucosidase genes. 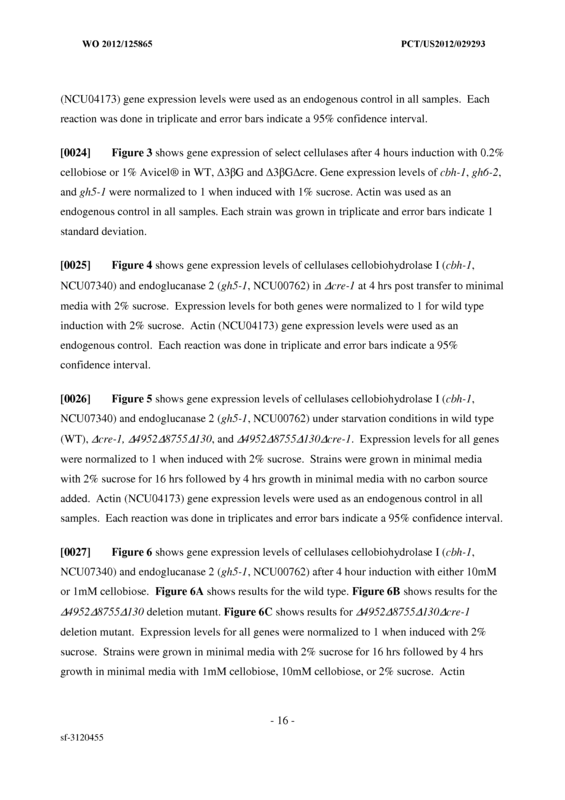 The method of any one of claims 34-53, wherein the two or more β-glucosidase genes are four or more β-glucosidase genes. 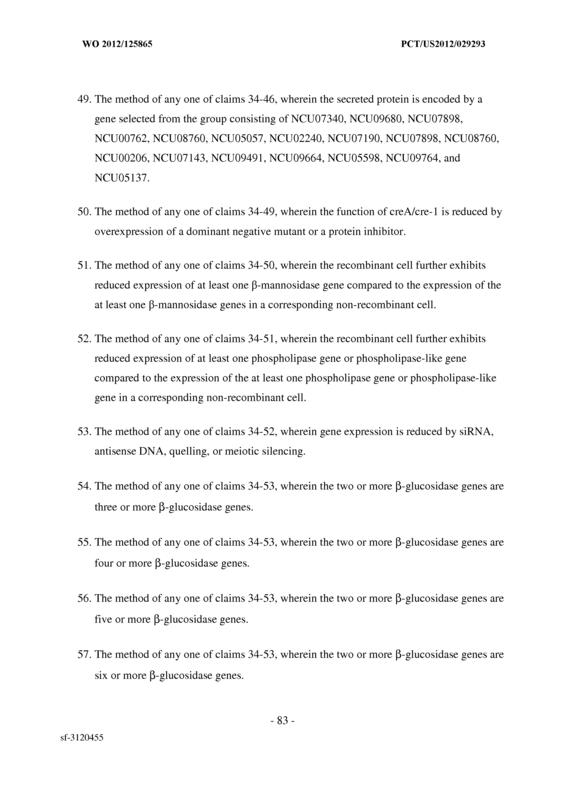 The method of any one of claims 34-53, wherein the two or more β-glucosidase genes are five or more β-glucosidase genes. 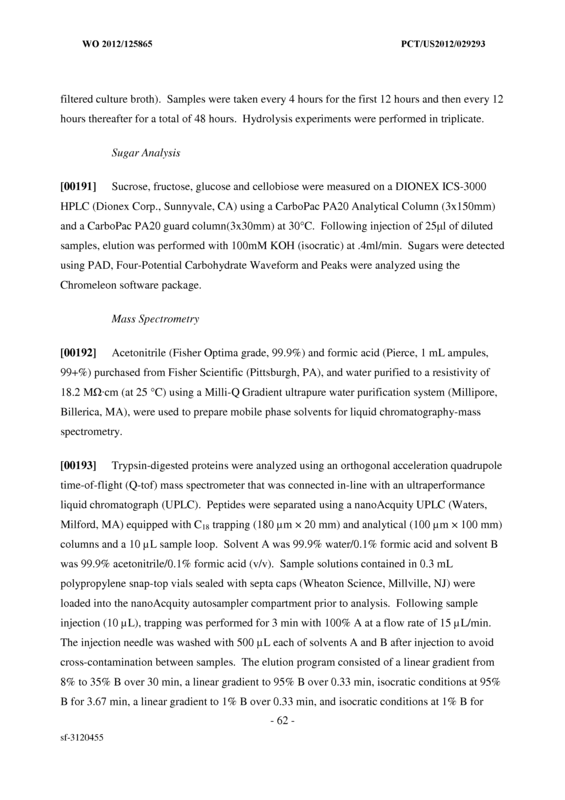 The method of any one of claims 34-53, wherein the two or more β-glucosidase genes are six or more β-glucosidase genes. 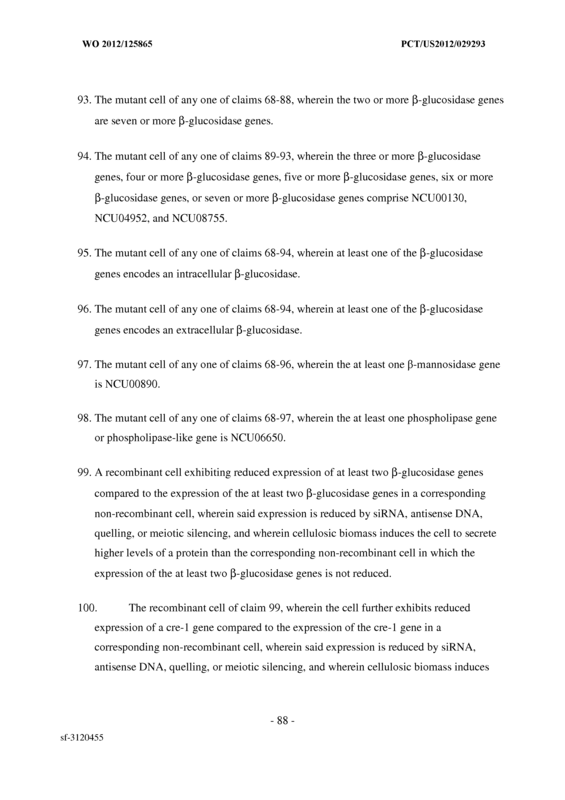 The method of any one of claims 34-53, wherein the two or more β-glucosidase genes are seven or more β-glucosidase genes. 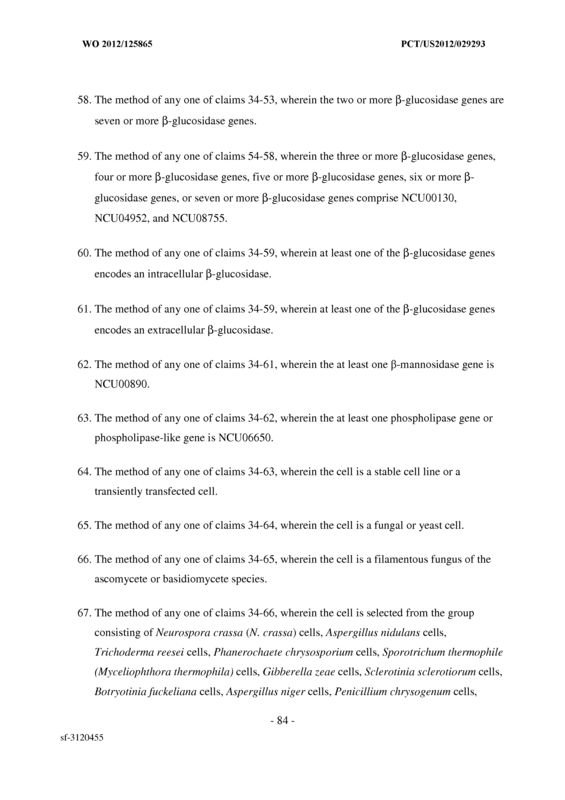 The method of any one of claims 34-59, wherein at least one of the β-glucosidase genes encodes an intracellular β-glucosidase. 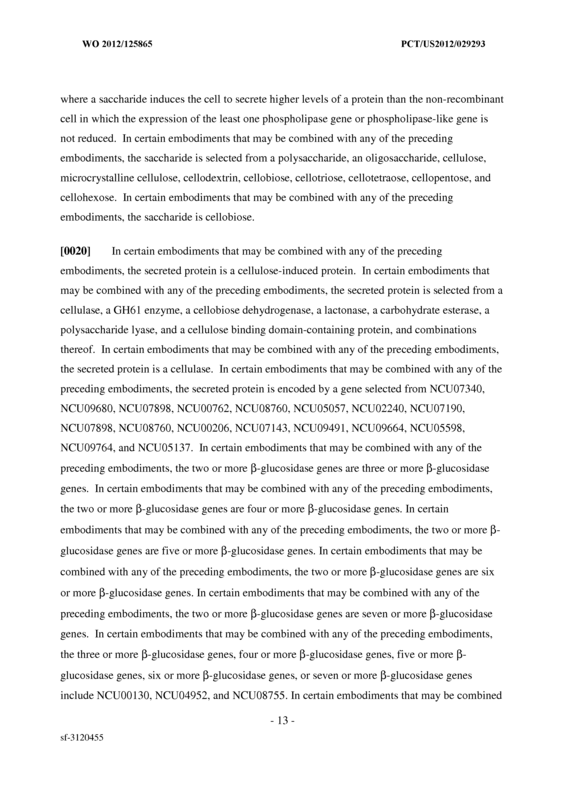 The method of any one of claims 34-59, wherein at least one of the β-glucosidase genes encodes an extracellular β-glucosidase. 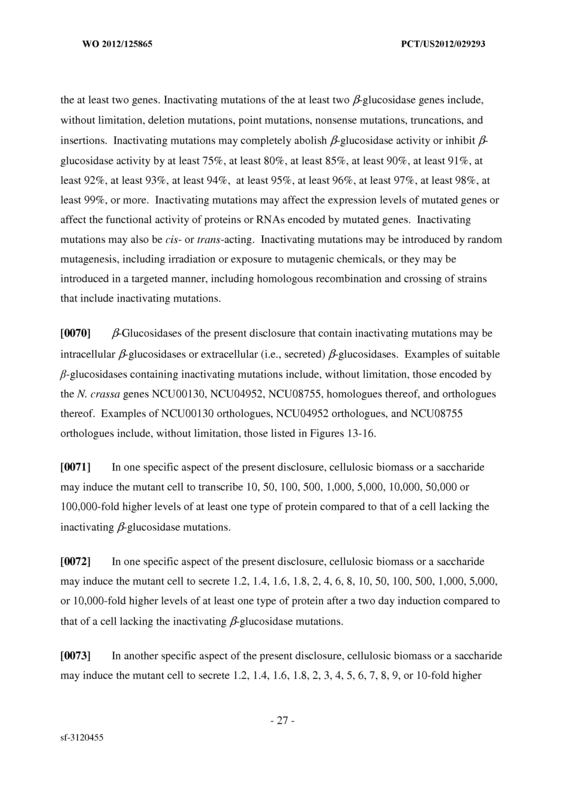 The method of any one of claims 34-61, wherein the at least one β-mannosidase gene is NCU00890. 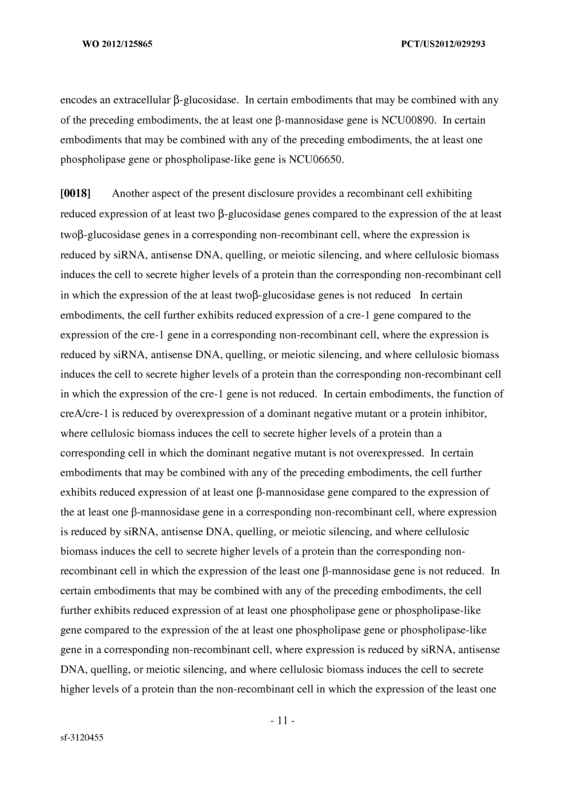 The method of any one of claims 34-62, wherein the at least one phospholipase gene or phospholipase-like gene is NCU06650. 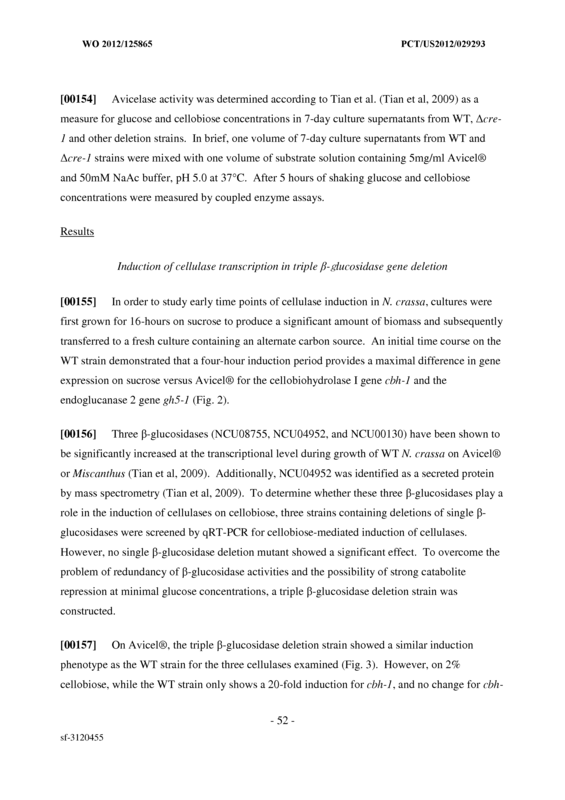 The method of any one of claims 34-64, wherein the cell is a fungal or yeast cell. 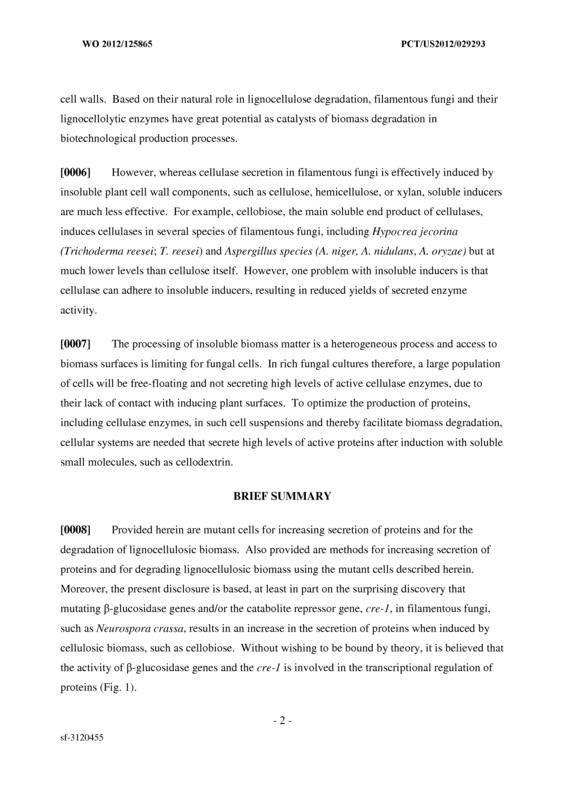 The method of any one of claims 34-65, wherein the cell is a filamentous fungus of the ascomycete or basidiomycete species. 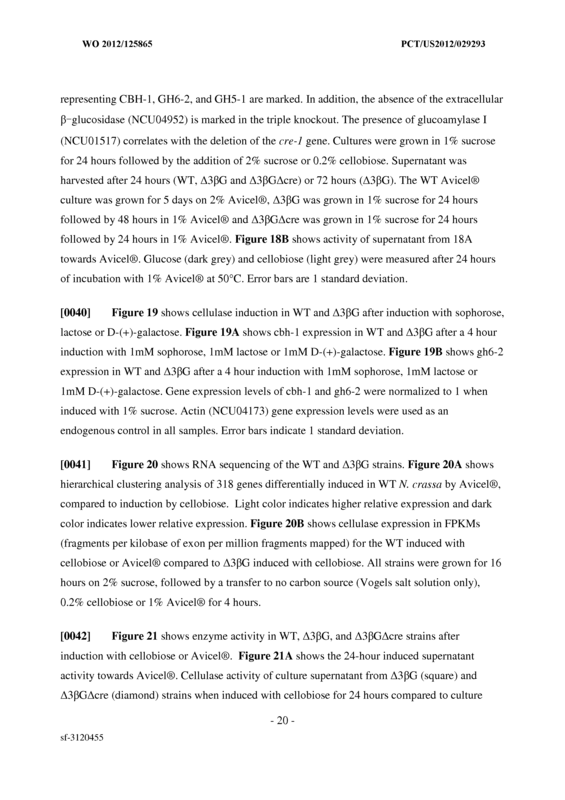 - 84 - sf-3120455 Schizophyllum commune cells, Postia placenta cells, Aspergillus oryzae cells, and Acremonium cellulolyticus cells. 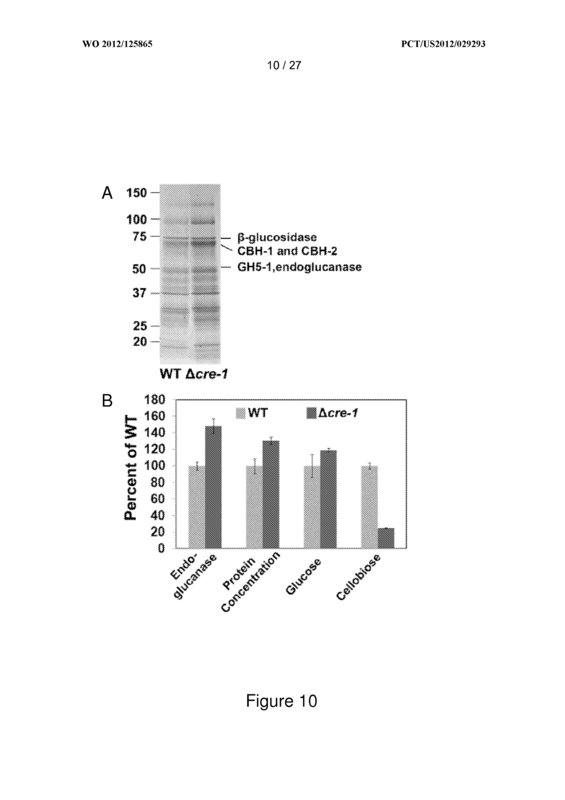 A mutant cell comprising inactivating mutations in two or more β-glucosidase genes, wherein cellulosic biomass induces the cell to secrete higher levels of a protein than a corresponding cell lacking said mutation in the two or more β-glucosidase genes. 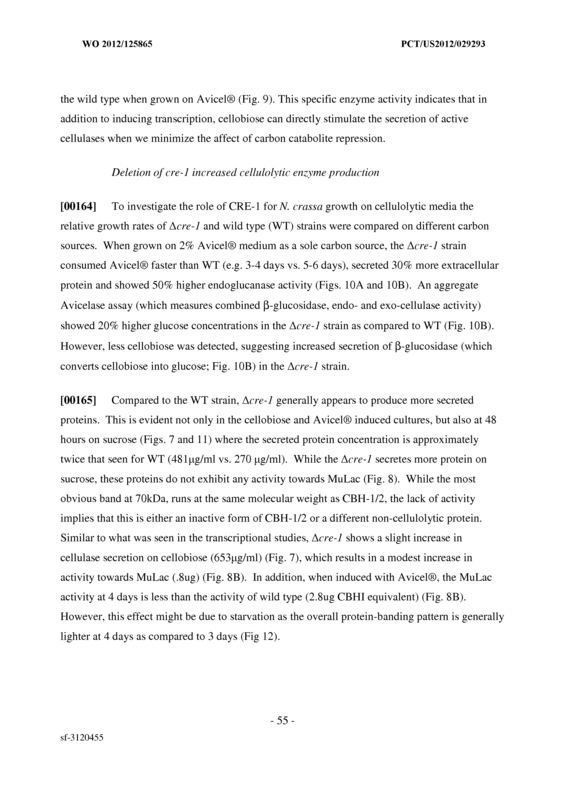 The mutant cell of claim 68, further comprising an inactivating mutation in a cre-1 gene in said cell, wherein cellulosic biomass induces the cell to secrete higher levels of a protein than a corresponding cell lacking said mutation in the cre-1 gene. 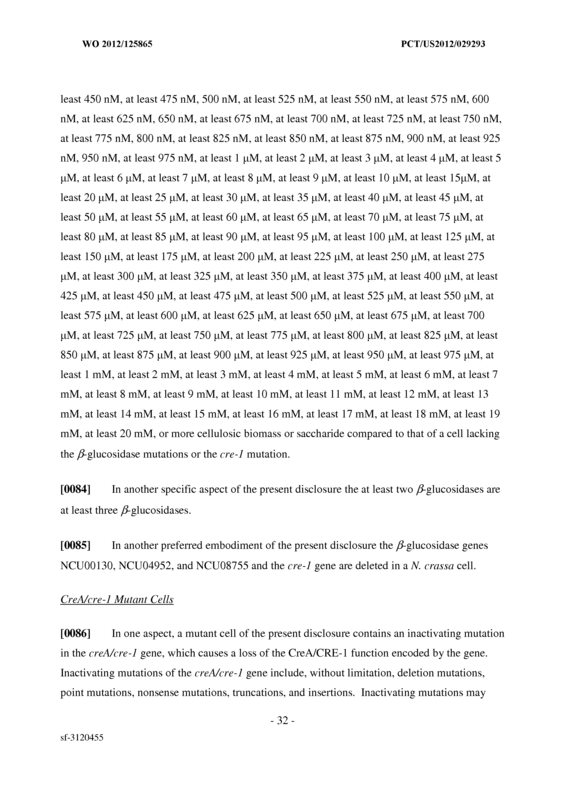 The mutant cell of claim 68 or claim 69, further comprising an inactivating mutation in at least one β-mannosidase gene in said cell, wherein cellulosic biomass induces the cell to secrete higher levels of a protein than a corresponding cell lacking said mutation in the at least one β-mannosidase gene. 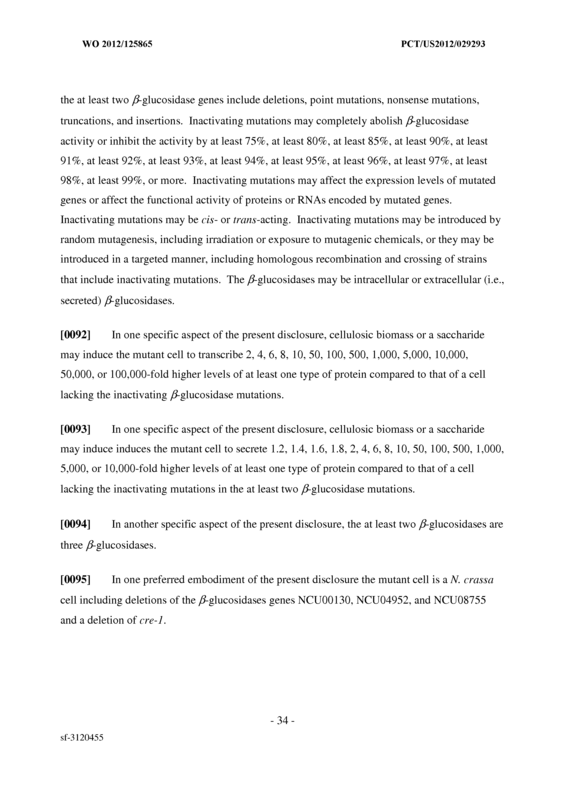 corresponding cell lacking said mutation in the at least one phospholipase gene or phospholipase-like gene. 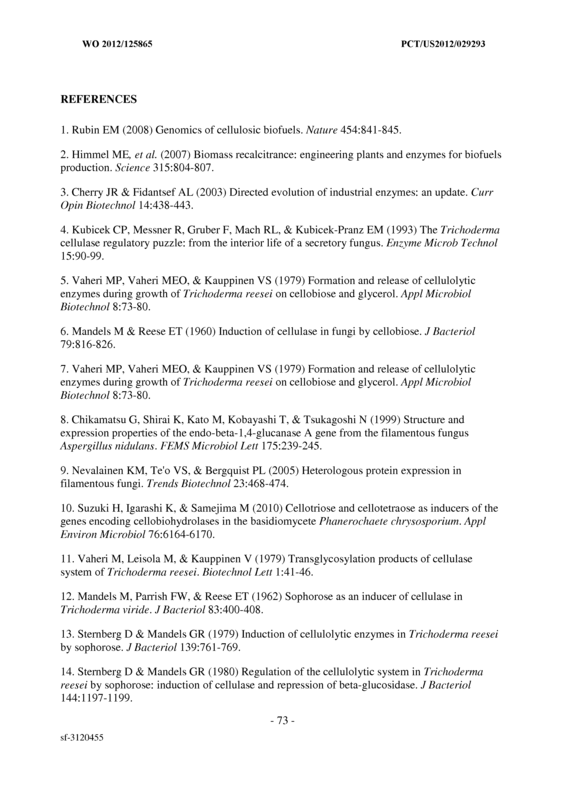 The mutant cell of any one of claims 68-71, wherein the cellulosic biomass comprises one or more of a polysaccharide, an oligosaccharide, cellulose, microcrystalline cellulose, cellodextrin, cellobiose, cellotriose, cellotetraose, cellopentose, and cellohexose. 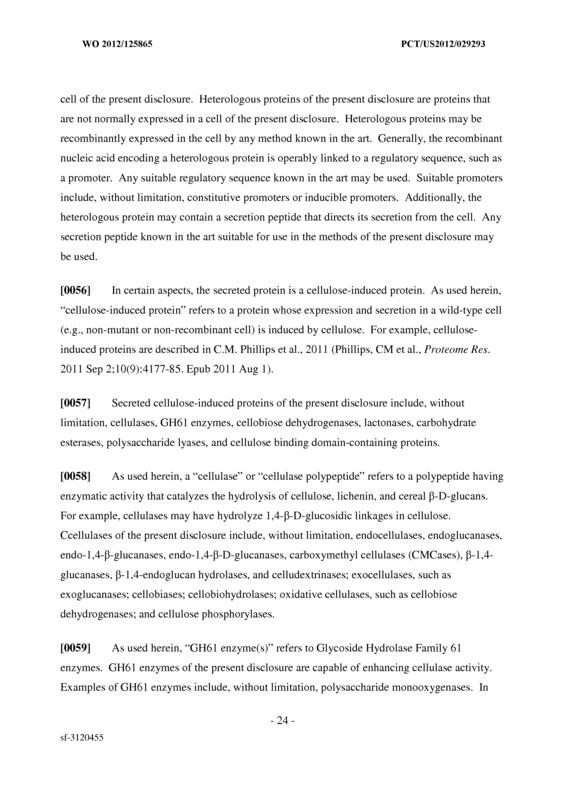 The mutant cell of any one of claims 68-71, wherein the cellulosic biomass comprises cellobiose. 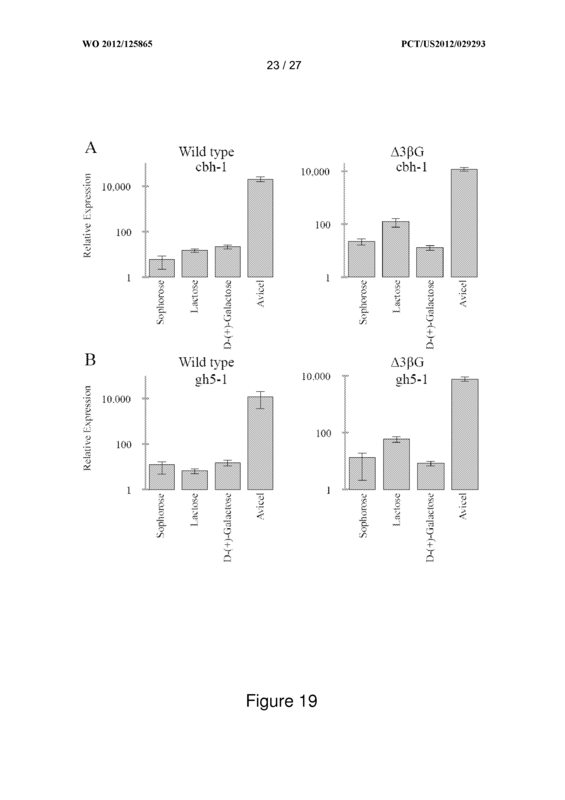 A mutant cell comprising inactivating mutations in two or more β-glucosidase genes, wherein a saccharide induces the cell to secrete higher levels of a protein than a corresponding cell lacking said mutation in the two or more β-glucosidase genes. 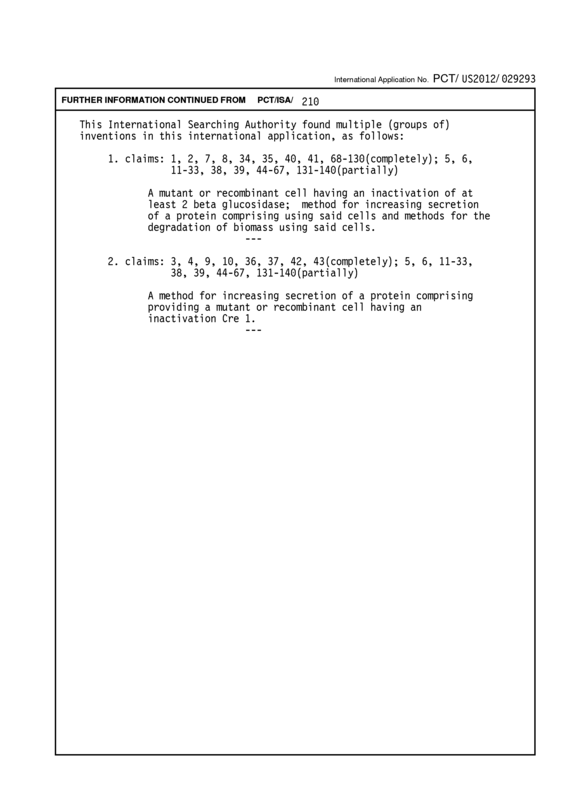 The mutant cell of claim 74, further comprising an inactivating mutation in a cre-1 gene in said cell, wherein a saccharide induces the cell to secrete higher levels of a protein than a corresponding cell lacking said mutation in the cre-1 gene. 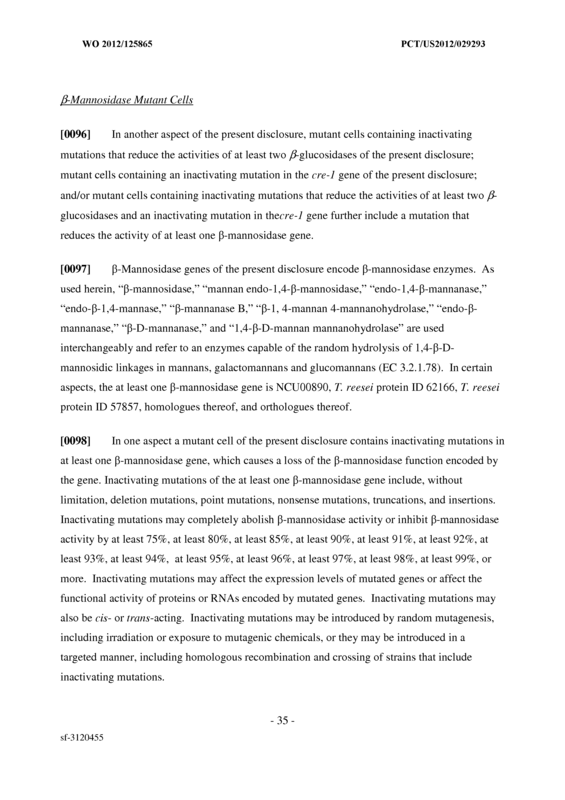 The mutant cell of claim 74 or claim 75, further comprising an inactivating mutation in at least one β-mannosidase gene in said cell, wherein a saccharide induces the cell to secrete higher levels of a protein than a corresponding cell lacking said mutation in the at least one β-mannosidase gene. 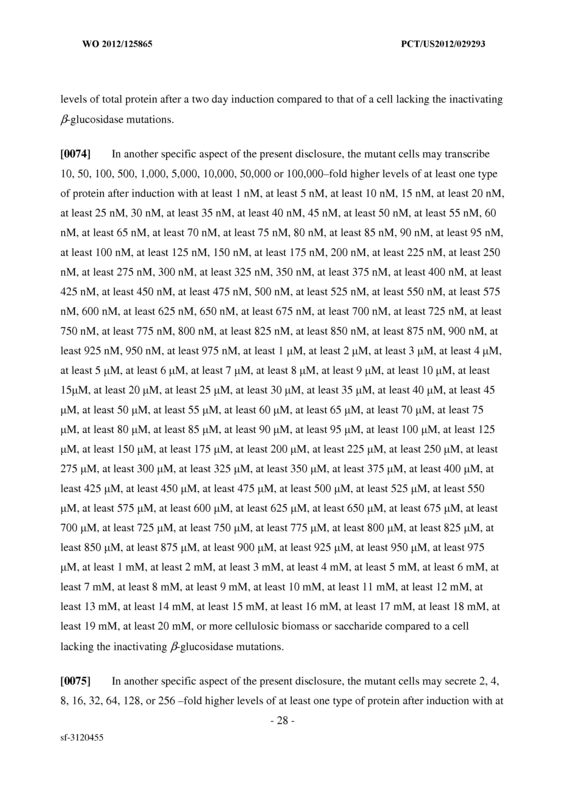 The mutant cell of any one of claims 74-76, further comprising an inactivating mutation in at least one phospholipase gene or phospholipase-like gene in said cell, wherein a saccharide induces the cell to secrete higher levels of a protein than a corresponding cell lacking said mutation in the at least one phospholipase gene or phospholipase-like gene. 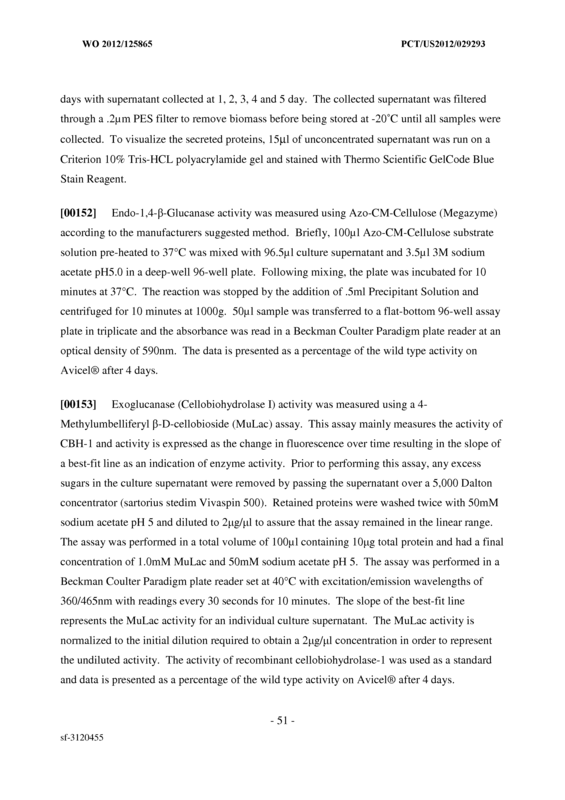 The mutant cell of any one of claims 74-77, wherein the saccharide is cellobiose. 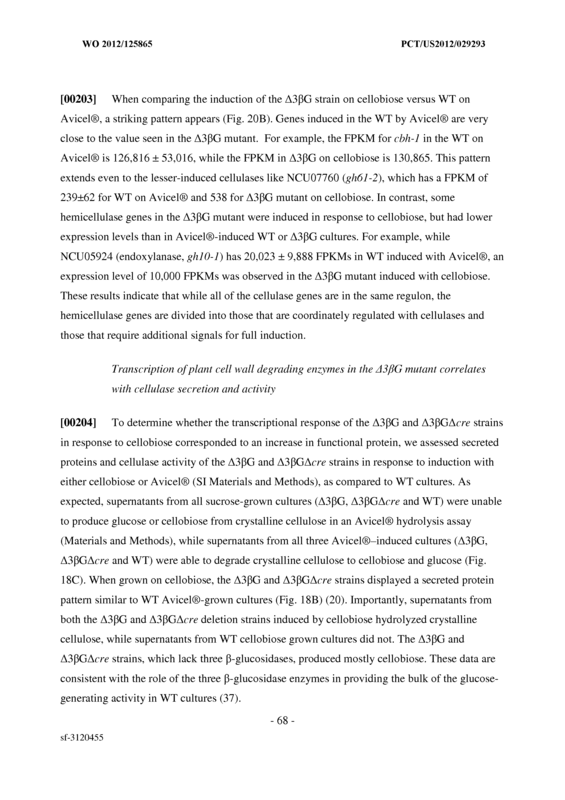 The mutant cell of any one of claims 68-79, wherein the secreted protein is a cellulose- induced protein. 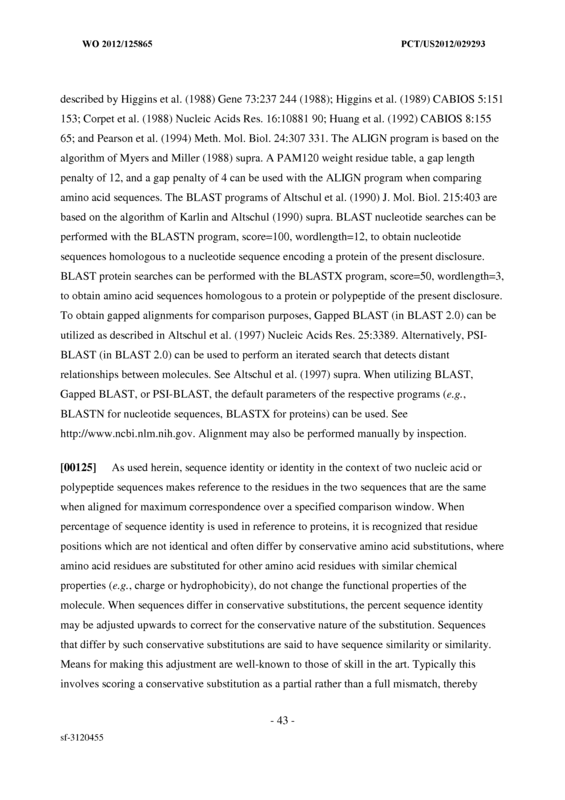 The mutant cell of any one of claims 68-80, wherein the secreted protein is selected from the group consisting of a cellulase, a GH61 enzyme, a cellobiose dehydrogenase, a lactonase, a carbohydrate esterase, a polysaccharide lyase, a cellulose binding domain- containing protein, and combinations thereof. 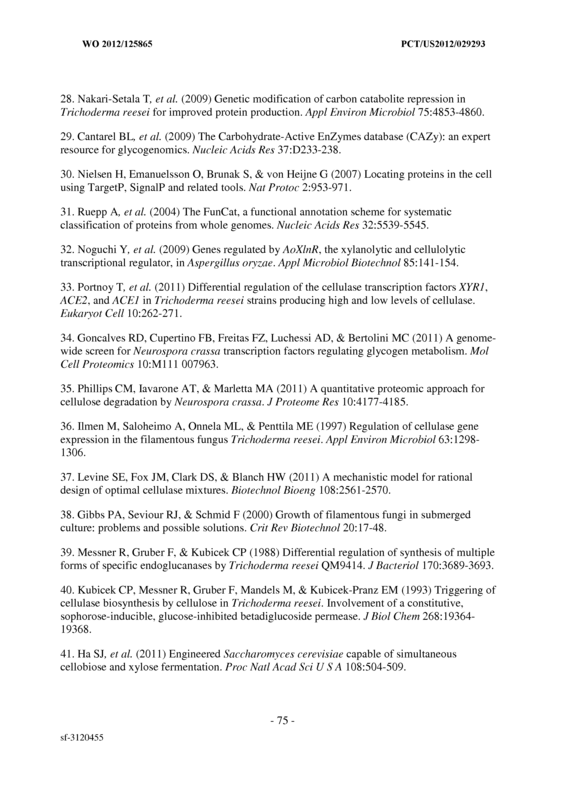 The mutant cell of any one of claims 68-80, wherein the secreted protein is a cellulase. 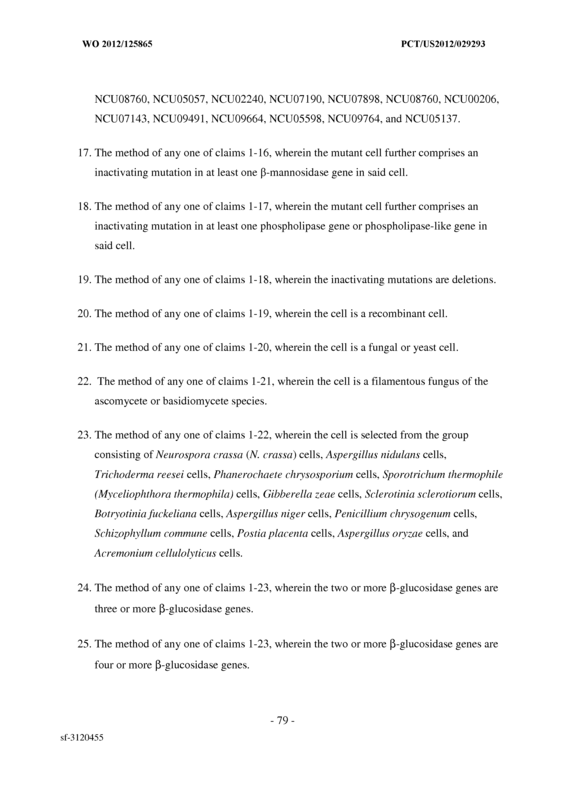 The mutant cell of any one of claims 68-84, wherein the cell is a recombinant cell. 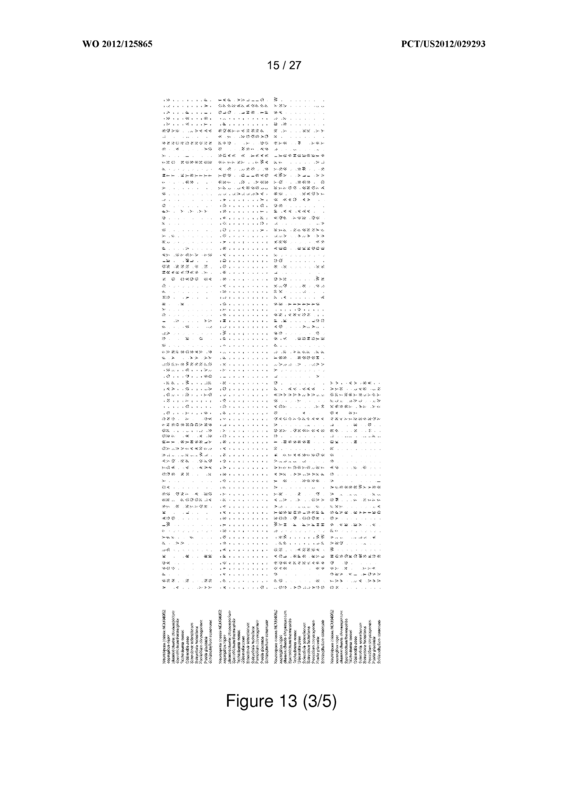 The mutant cell of any one of claims 68-85, wherein the cell is a fungal or yeast cell. 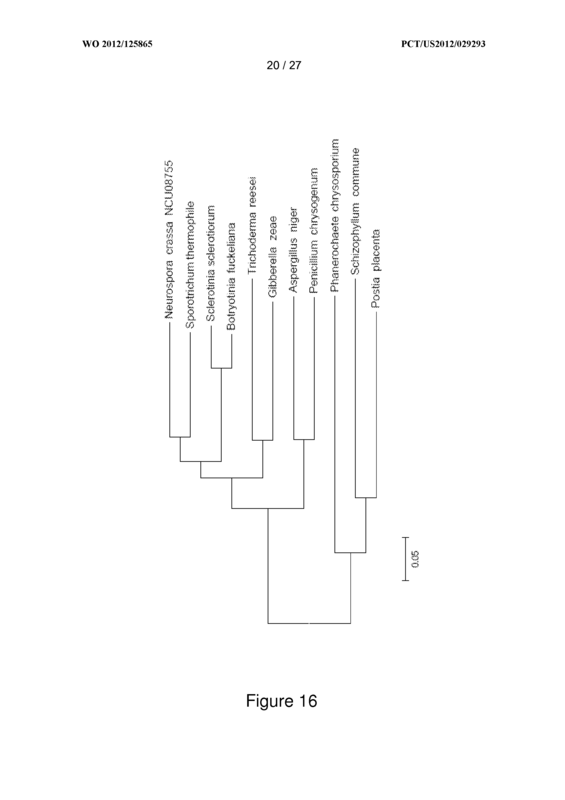 The mutant cell of any one of claims 68-86, wherein the cell is a filamentous fungus of the ascomycete or basidiomycete species. 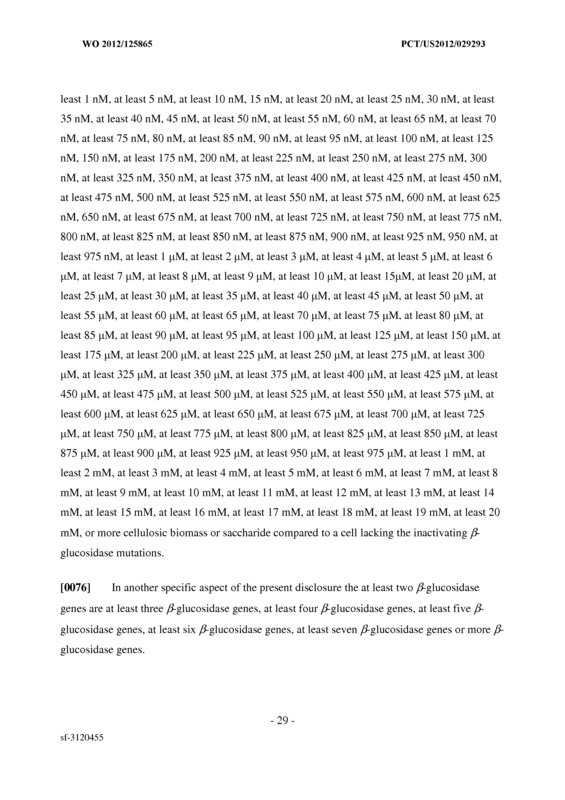 The mutant cell of any one of claims 68-88, wherein the two or more β-glucosidase genes are three or more β-glucosidase genes. 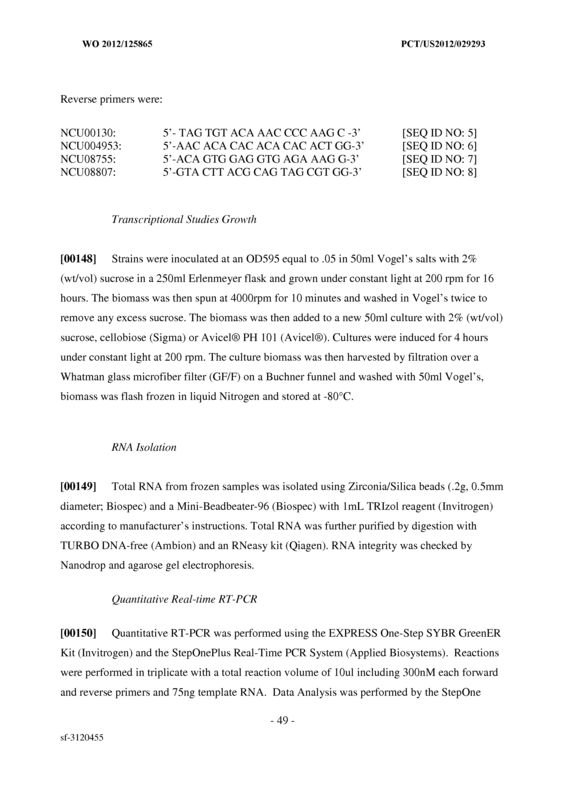 The mutant cell of any one of claims 68-88, wherein the two or more β-glucosidase genes are four or more β-glucosidase genes. 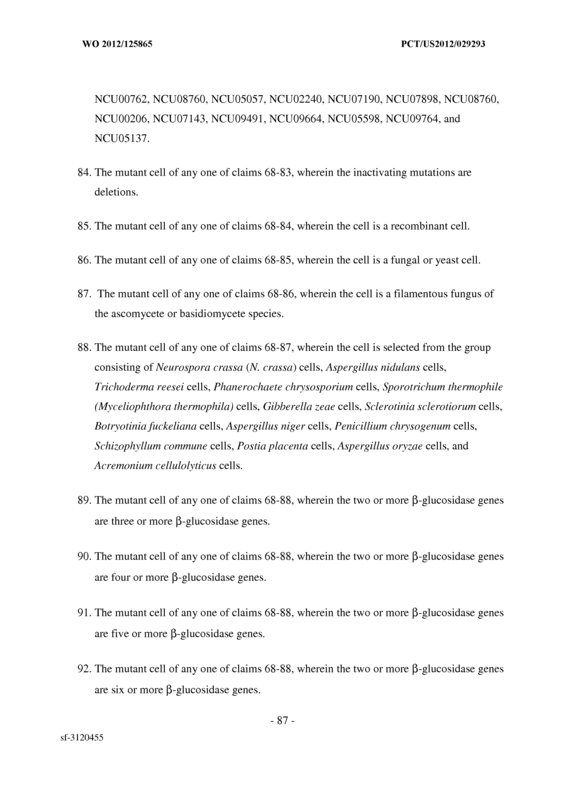 The mutant cell of any one of claims 68-88, wherein the two or more β-glucosidase genes are five or more β-glucosidase genes. 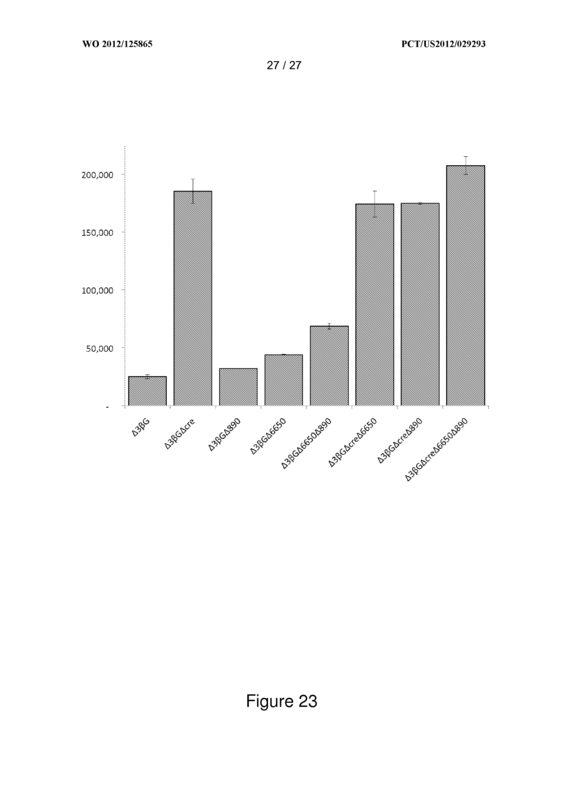 The mutant cell of any one of claims 68-88, wherein the two or more β-glucosidase genes are six or more β-glucosidase genes. 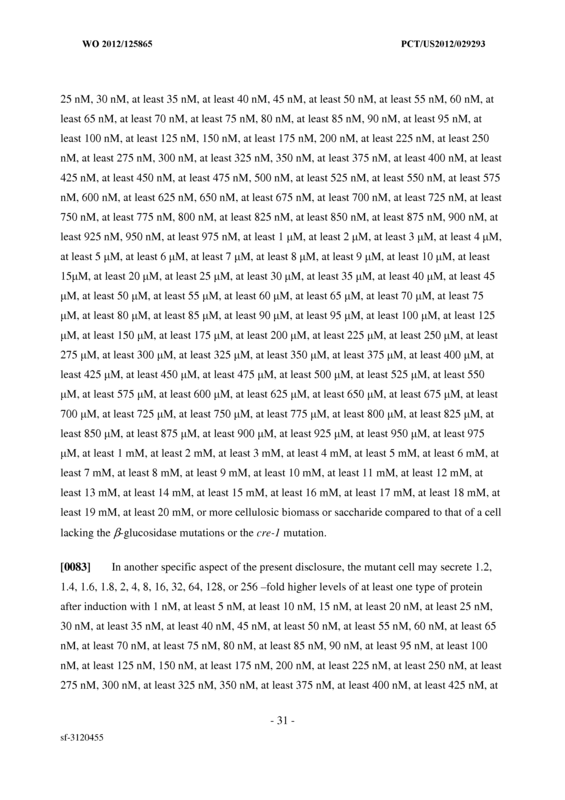 The mutant cell of any one of claims 68-88, wherein the two or more β-glucosidase genes are seven or more β-glucosidase genes. 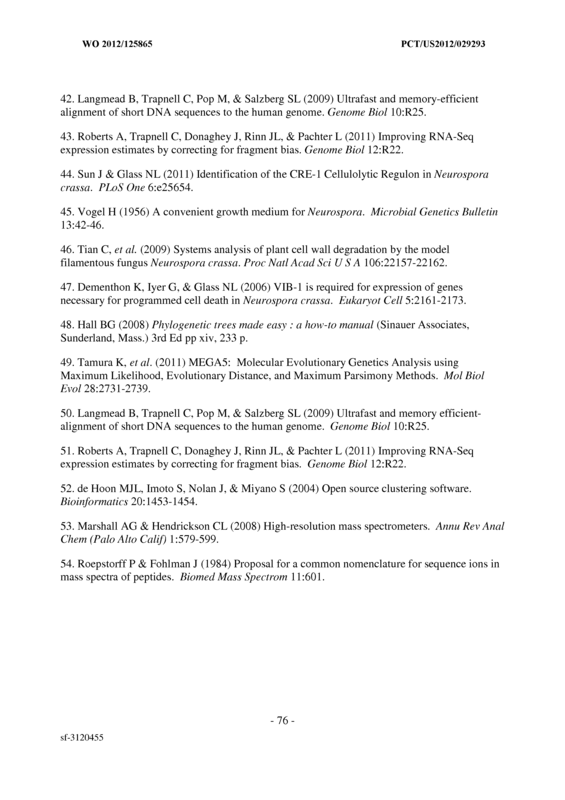 The mutant cell of any one of claims 89-93, wherein the three or more β-glucosidase genes, four or more β-glucosidase genes, five or more β-glucosidase genes, six or more β-glucosidase genes, or seven or more β-glucosidase genes comprise NCU00130, NCU04952, and NCU08755. 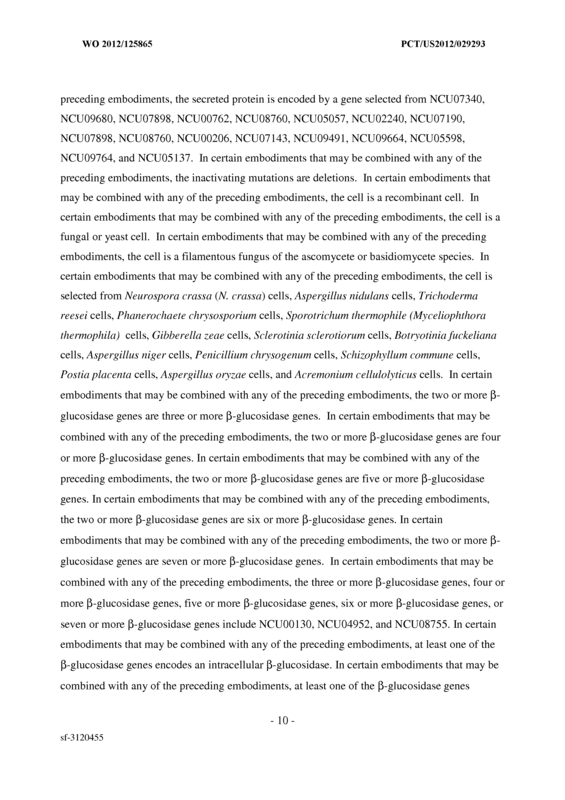 The mutant cell of any one of claims 68-94, wherein at least one of the β-glucosidase genes encodes an intracellular β-glucosidase. 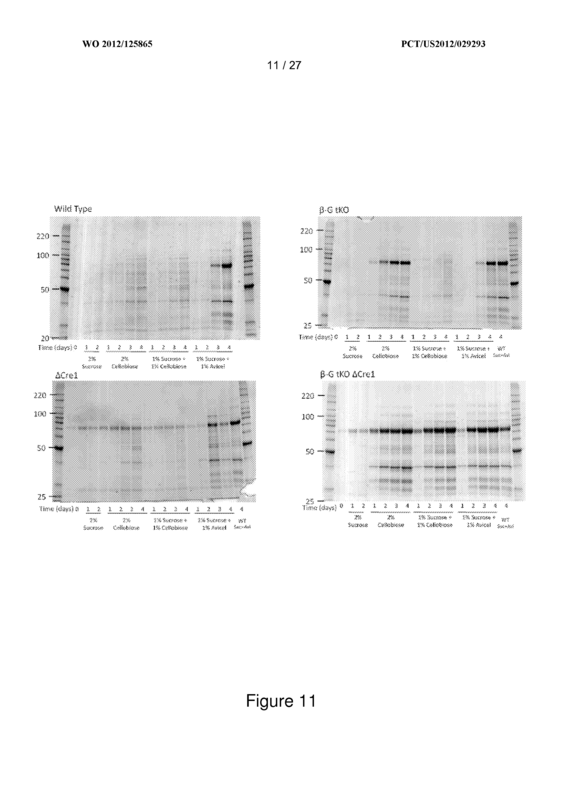 The mutant cell of any one of claims 68-94, wherein at least one of the β-glucosidase genes encodes an extracellular β-glucosidase. 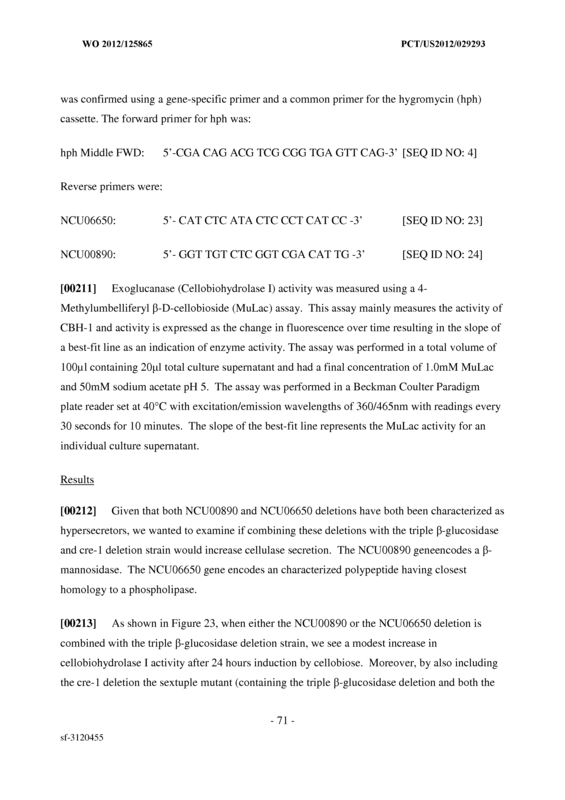 The mutant cell of any one of claims 68-96, wherein the at least one β-mannosidase gene is NCU00890. 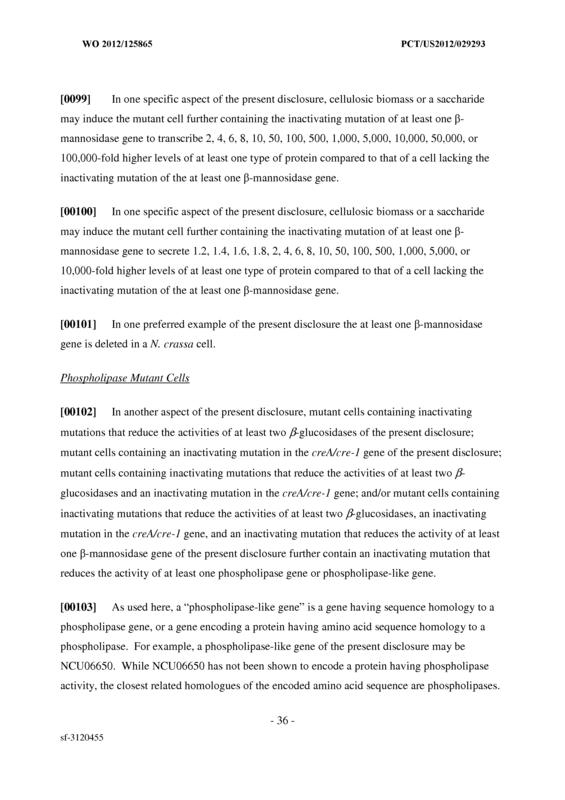 The mutant cell of any one of claims 68-97, wherein the at least one phospholipase gene or phospholipase-like gene is NCU06650. 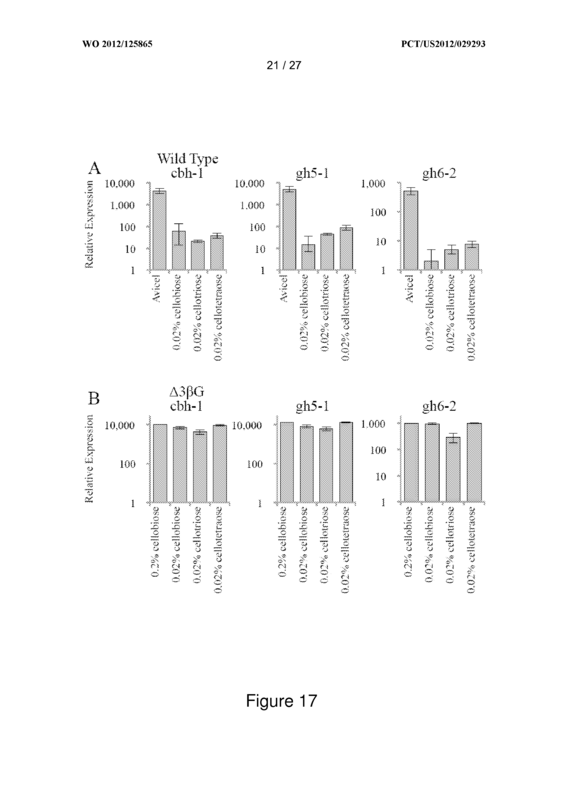 A recombinant cell exhibiting reduced expression of at least two β-glucosidase genes compared to the expression of the at least two β-glucosidase genes in a corresponding non-recombinant cell, wherein said expression is reduced by siRNA, antisense DNA, quelling, or meiotic silencing, and wherein cellulosic biomass induces the cell to secrete higher levels of a protein than the corresponding non-recombinant cell in which the expression of the at least two β-glucosidase genes is not reduced. 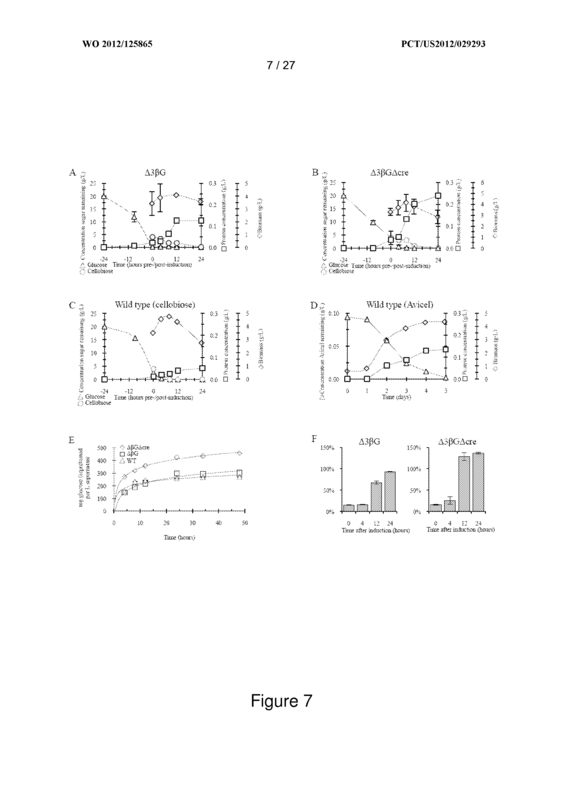 - 88 - sf-3120455 the cell to secrete higher levels of a protein than the corresponding non-recombinant cell in which the expression of the cre-1 gene is not reduced. 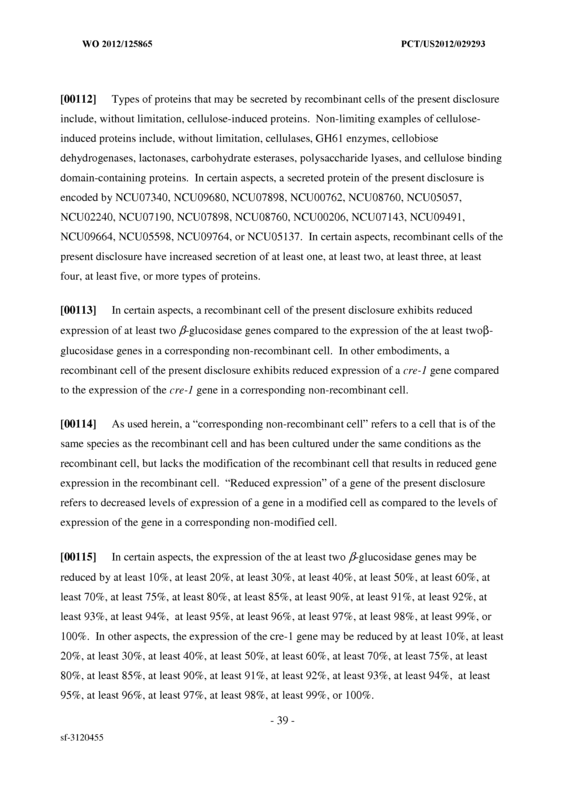 corresponding cell in which the dominant negative mutant is not overexpressed. 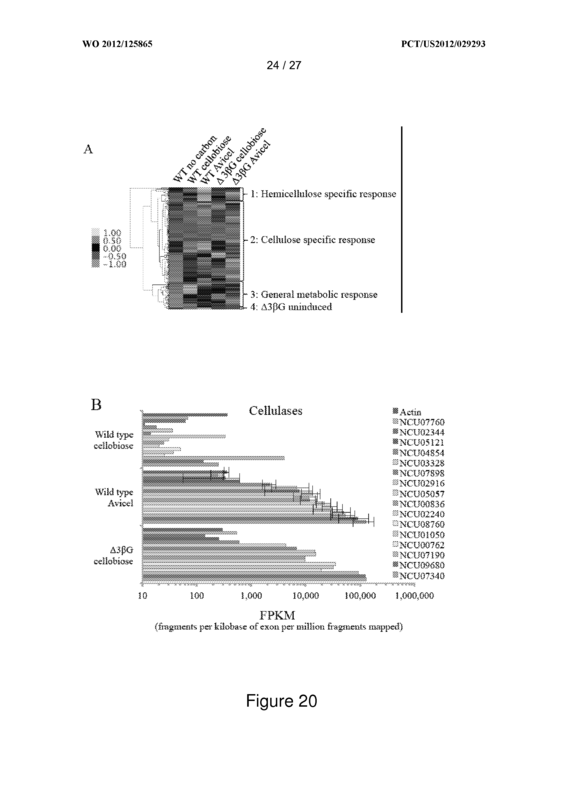 exhibits reduced expression of at least one β-mannosidase gene compared to the expression of the at least one β-mannosidase gene in a corresponding non-recombinant cell, wherein said expression is reduced by siRNA, antisense DNA, quelling, or meiotic silencing, and wherein cellulosic biomass induces the cell to secrete higher levels of a protein than the corresponding non-recombinant cell in which the expression of the least one β-mannosidase gene is not reduced. 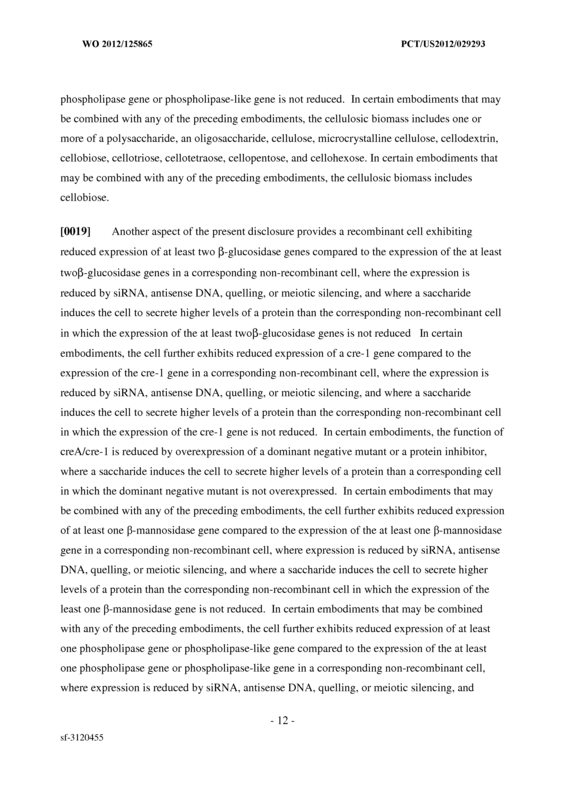 exhibits reduced expression of at least one phospholipase gene or phospholipase-like gene compared to the expression of the at least one phospholipase gene or phospholipase- like gene in a corresponding non-recombinant cell, wherein said expression is reduced by siRNA, antisense DNA, quelling, or meiotic silencing, and wherein cellulosic biomass induces the cell to secrete higher levels of a protein than the corresponding non- recombinant cell in which the expression of the least one phospholipase gene or phospholipase-like gene is not reduced. 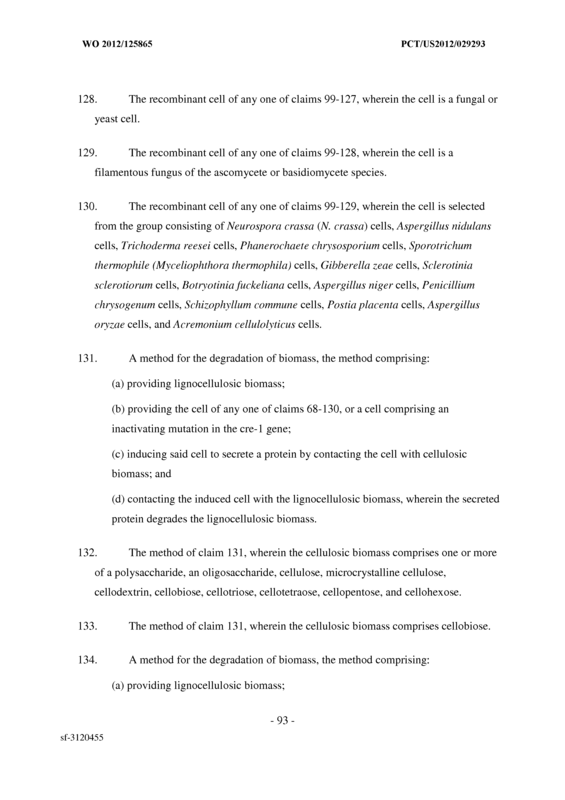 The recombinant cell of any one of claims 99-103, wherein the cellulosic biomass comprises cellobiose. 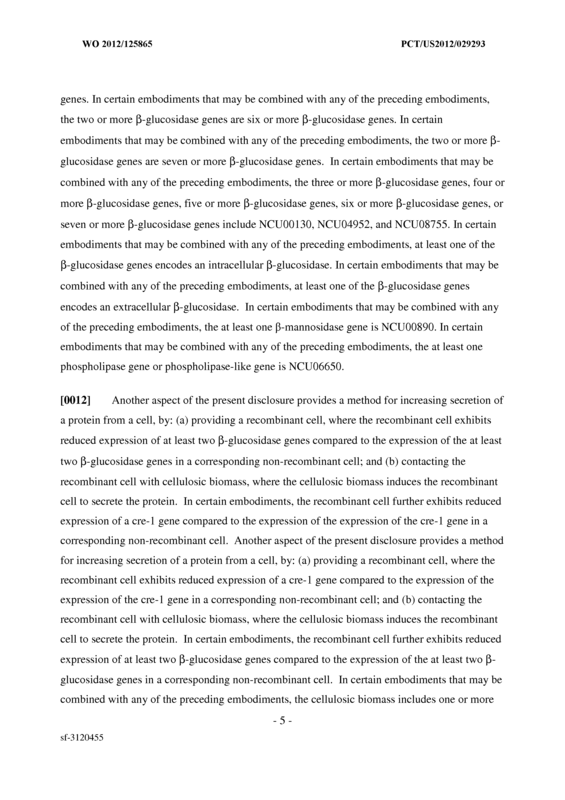 corresponding non-recombinant cell, wherein said expression is reduced by siRNA, antisense DNA, quelling, or meiotic silencing, and wherein a saccharide induces the cell to secrete higher levels of a protein than the corresponding non-recombinant cell in which the expression of the at least two -glucosidase genes is not reduced. 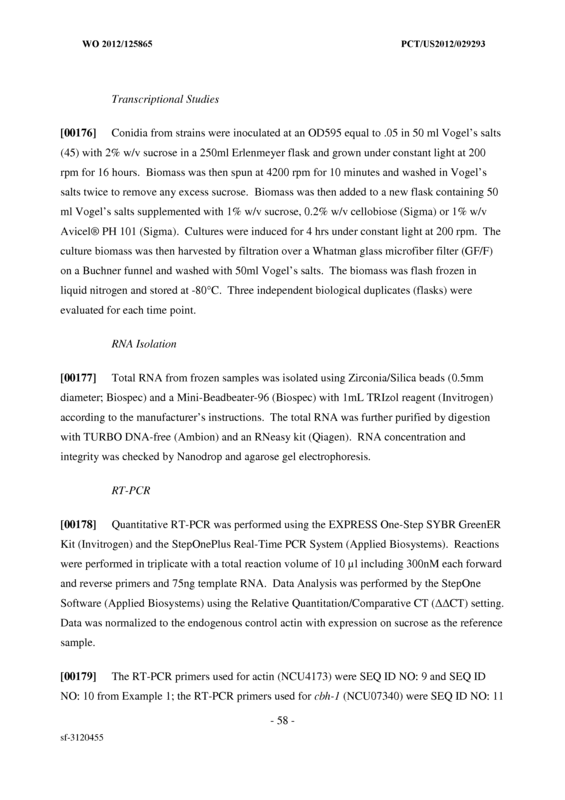 corresponding non-recombinant cell, wherein said expression is reduced by siRNA, antisense DNA, quelling, or meiotic silencing, and wherein a saccharide induces the cell to secrete higher levels of a protein than the corresponding non-recombinant cell in which the expression of the cre-1 gene is not reduced. 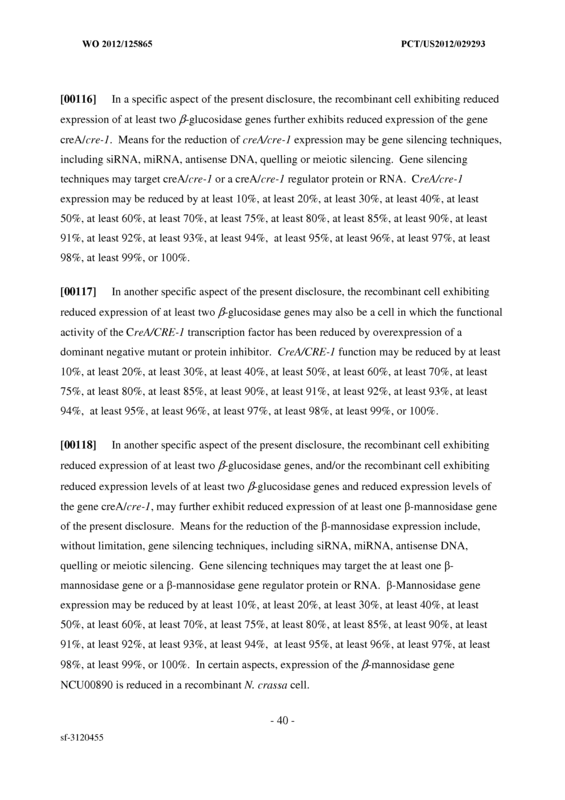 The recombinant cell of claim 107, wherein the function of creA/cre-1 is reduced by overexpression of a dominant negative mutant or a protein inhibitor, wherein a saccharide induces the cell to secrete higher levels of a protein than a corresponding cell in which the dominant negative mutant is not overexpressed. 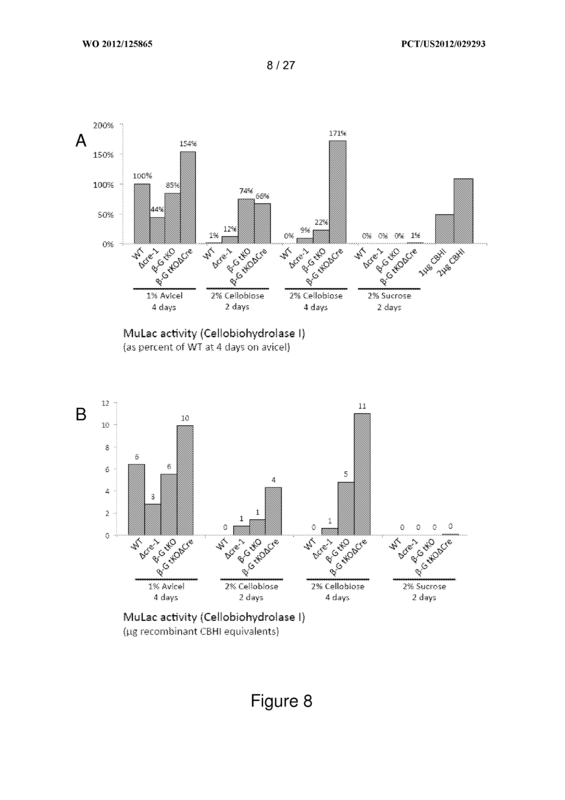 exhibits reduced expression of at least one β-mannosidase gene compared to the expression of the at least one β-mannosidase gene in a corresponding non-recombinant cell, wherein said expression is reduced by siRNA, antisense DNA, quelling, or meiotic silencing, and wherein a saccharide induces the cell to secrete higher levels of a protein than the corresponding non-recombinant cell in which the expression of the least one β- mannosidase gene is not reduced. 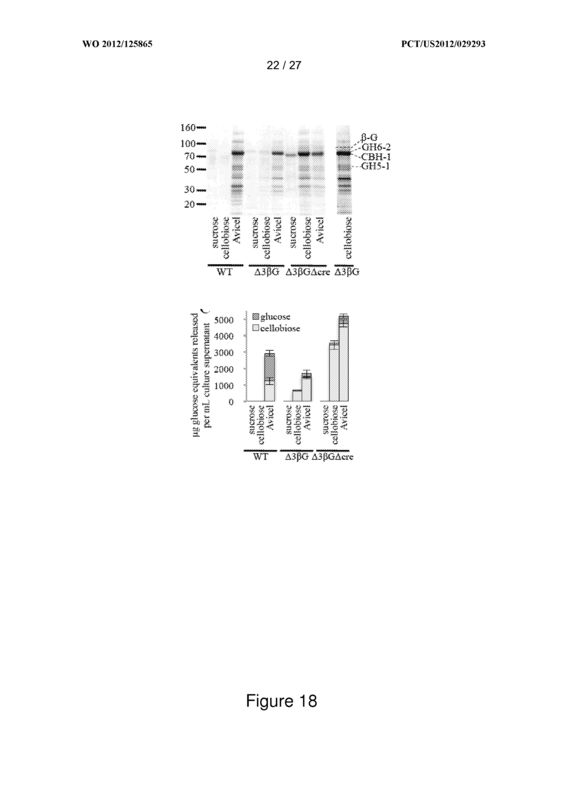 - 90 - sf-3120455 the cell to secrete higher levels of a protein than the corresponding non-recombinant cell in which the expression of the least one phospholipase gene or phospholipase-like gene is not reduced. 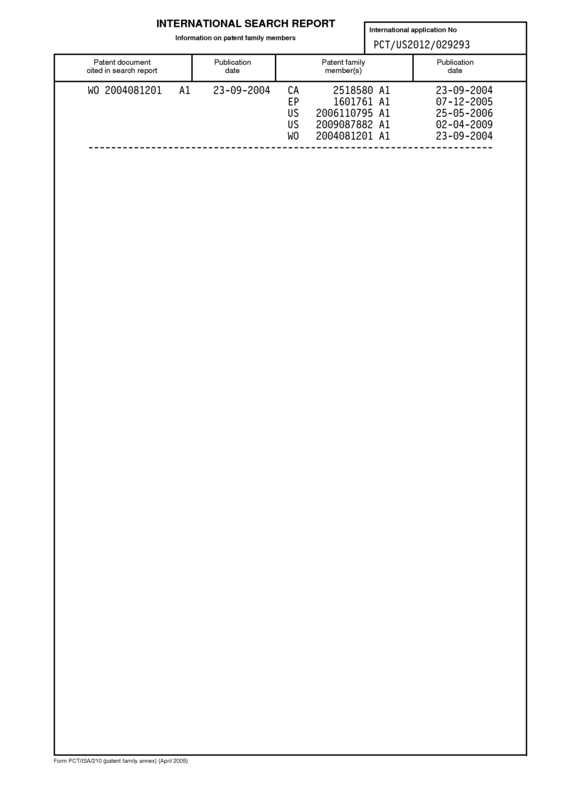 The recombinant cell of any one of claimsl06-l 10, wherein the saccharide is cellobiose. 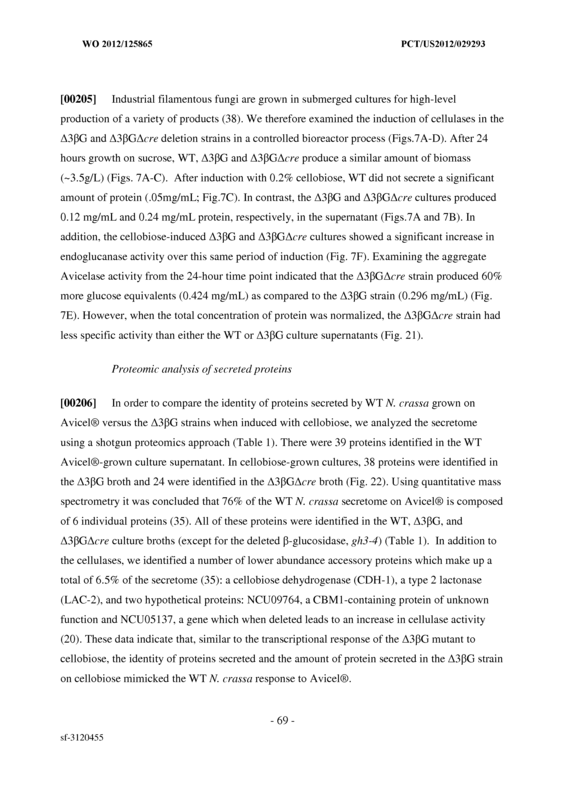 The recombinant cell of any one of claims 99-112, wherein the secreted protein is a cellulose-induced protein. 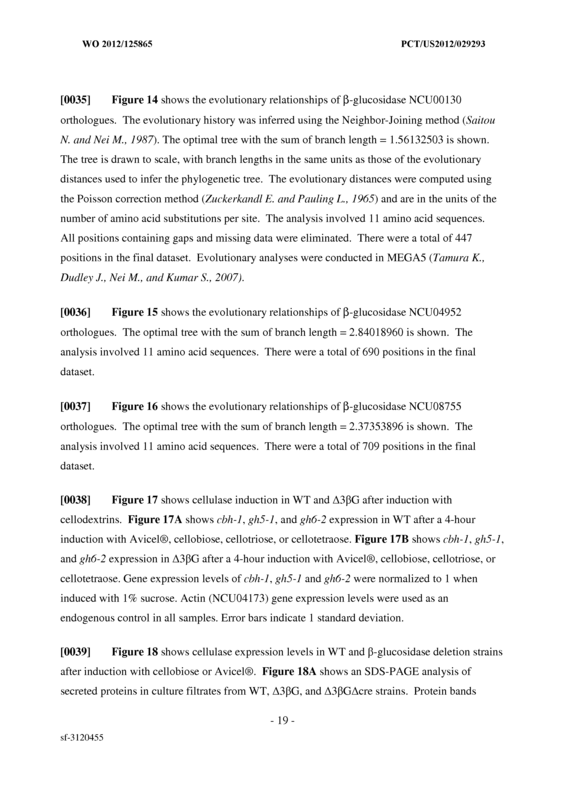 The recombinant cell of any one of claims 99-113, wherein the secreted protein is selected from the group consisting of a cellulase, a GH61 enzyme, a cellobiose dehydrogenase, a lactonase, a carbohydrate esterase, a polysaccharide lyase, a cellulose binding domain-containing protein, and combinations thereof. 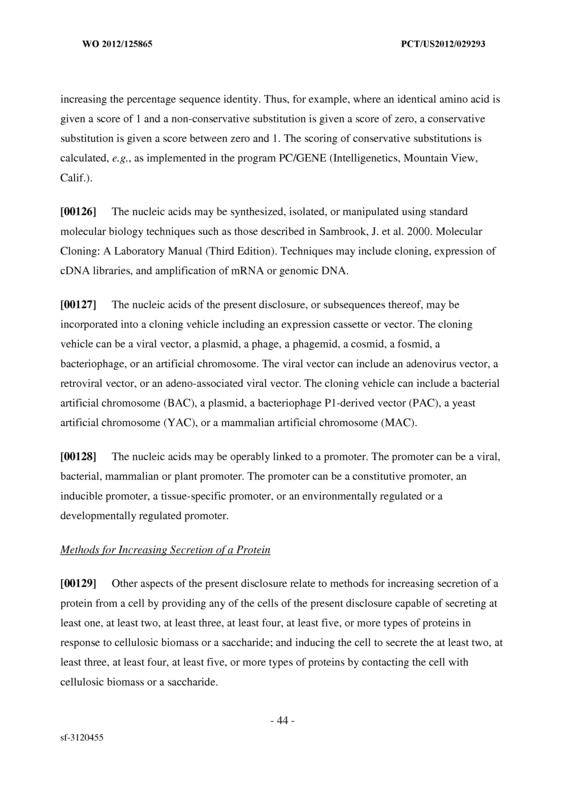 The recombinant cell of any one of claims 99-113, wherein the secreted protein is a cellulase. 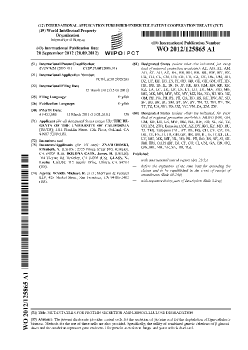 The recombinant cell of any one of claims 99-113, wherein the secreted protein is encoded by a gene selected from the group consisting of NCU07340, NCU09680, NCU07898, NCU00762, NCU08760, NCU05057, NCU02240, NCU07190, NCU07898, NCU08760, NCU00206, NCU07143, NCU09491, NCU09664, NCU05598, NCU09764, and NCU05137. 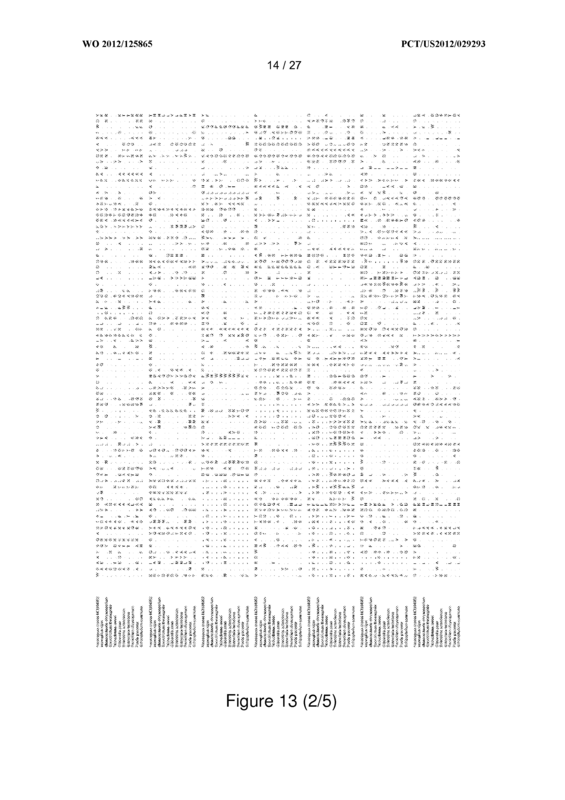 The recombinant cell of any one of claims 99-116, wherein the two or more β- glucosidase genes are three or more β-glucosidase genes. 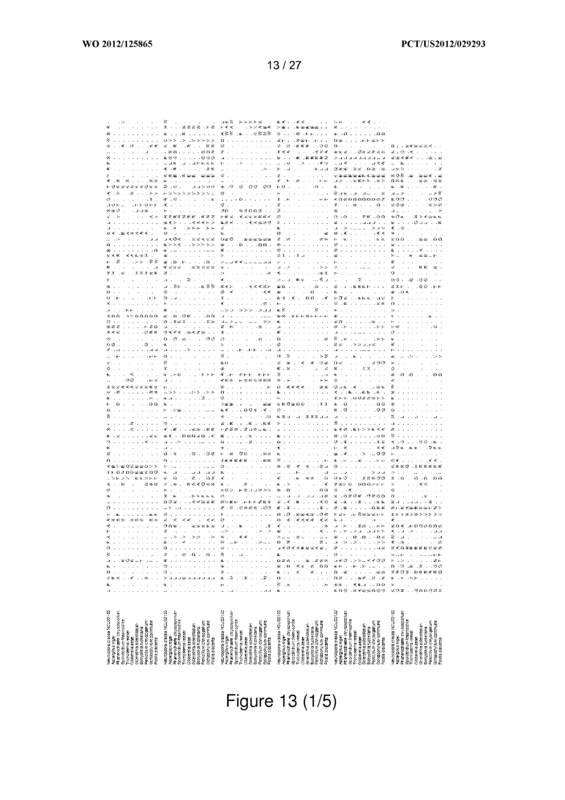 The recombinant cell of any one of claims 99-116, wherein the two or more β- glucosidase genes are four or more β-glucosidase genes. 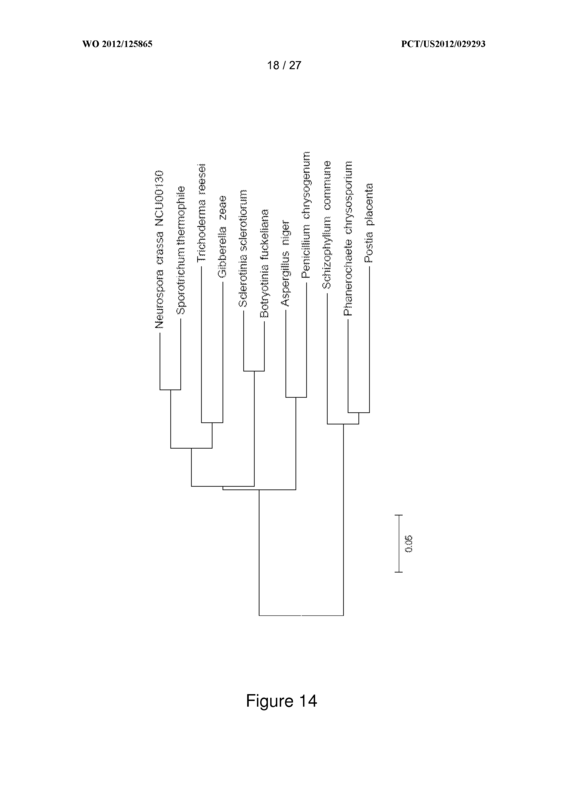 The recombinant cell of any one of claims 99-116, wherein the two or more β- glucosidase genes are five or more β-glucosidase genes. 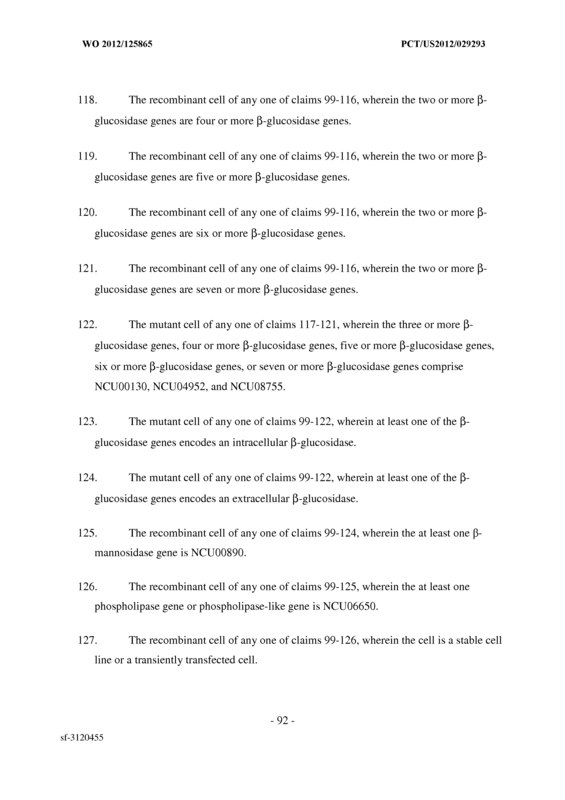 The recombinant cell of any one of claims 99-116, wherein the two or more β- glucosidase genes are six or more β-glucosidase genes. 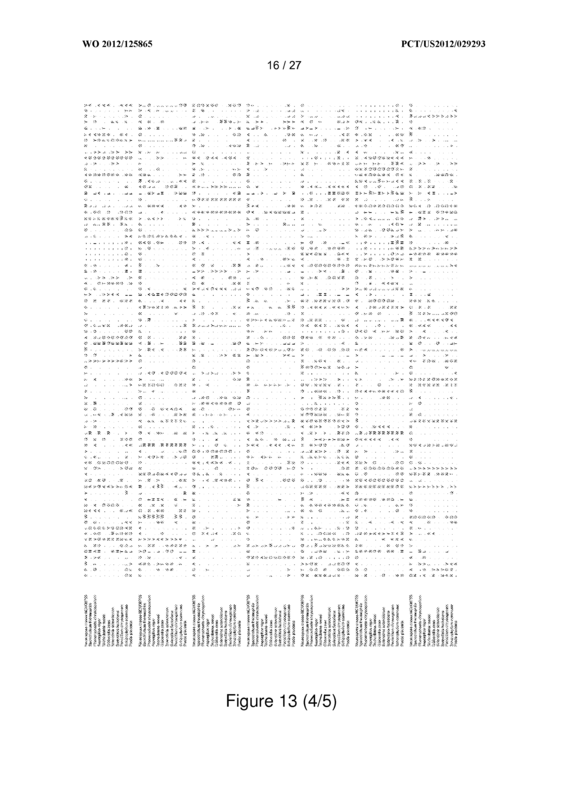 The recombinant cell of any one of claims 99-116, wherein the two or more β- glucosidase genes are seven or more β-glucosidase genes. 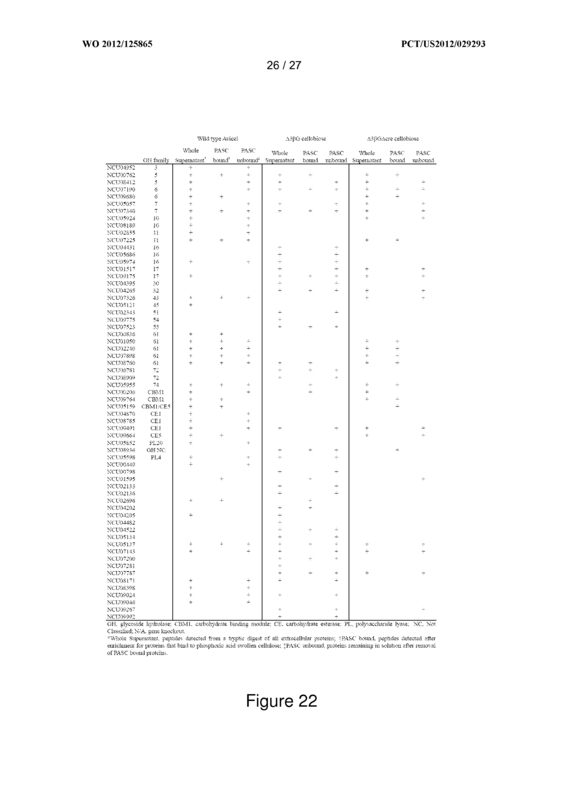 The mutant cell of any one of claims 117-121, wherein the three or more β- glucosidase genes, four or more β-glucosidase genes, five or more β-glucosidase genes, six or more β-glucosidase genes, or seven or more β-glucosidase genes comprise NCU00130, NCU04952, and NCU08755. 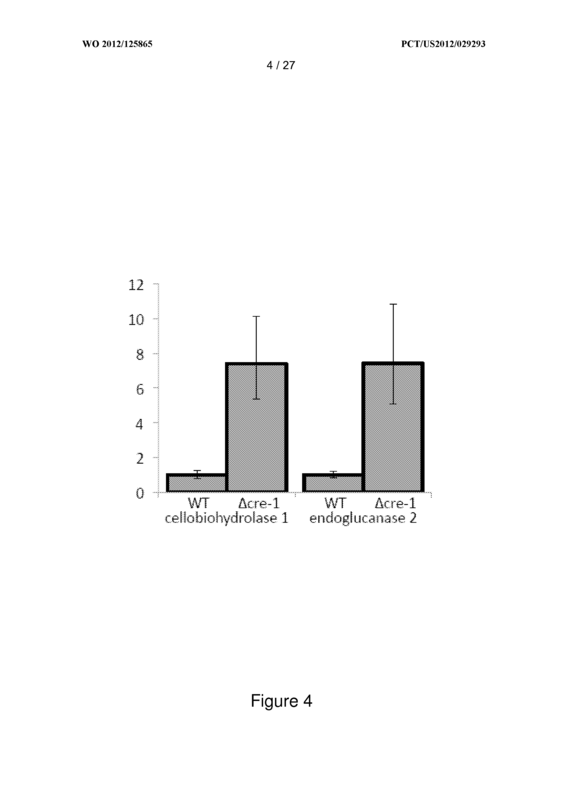 The mutant cell of any one of claims 99-122, wherein at least one of the β- glucosidase genes encodes an intracellular β -glucosidase. 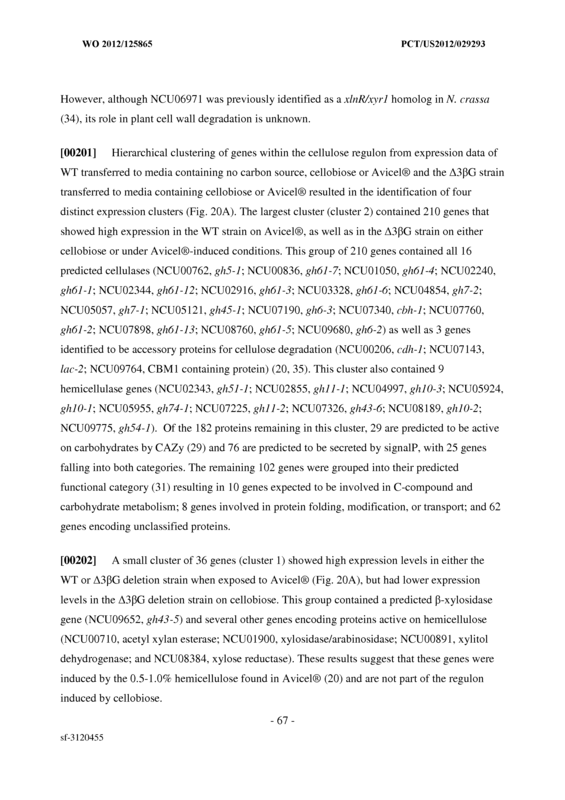 The mutant cell of any one of claims 99-122, wherein at least one of the β- glucosidase genes encodes an extracellular β-glucosidase. 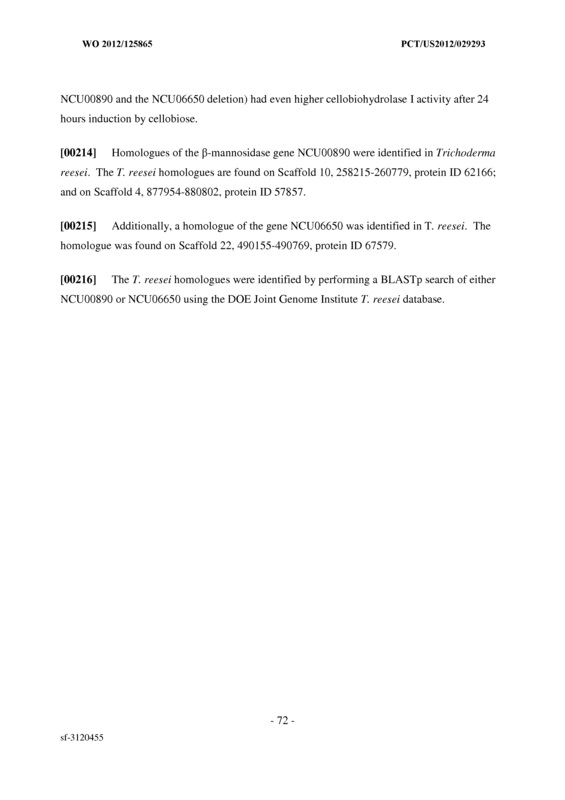 The recombinant cell of any one of claims 99-124, wherein the at least one β- mannosidase gene is NCU00890. 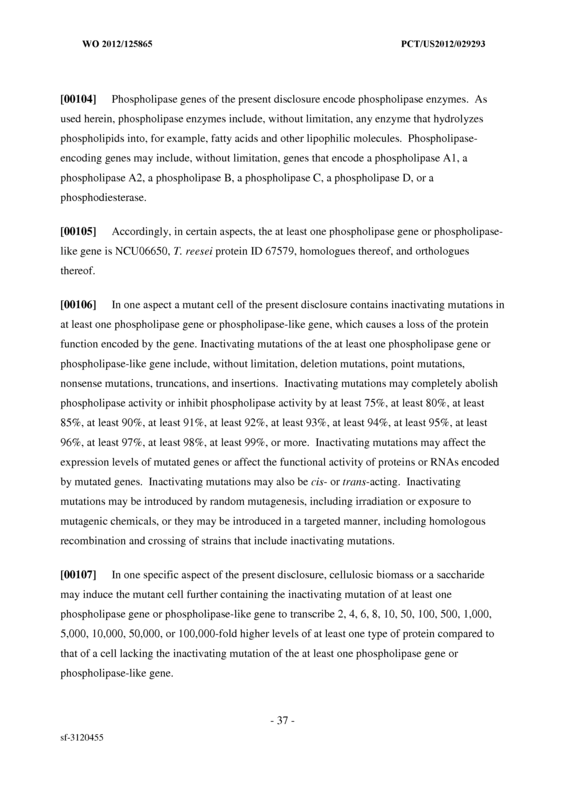 phospholipase gene or phospholipase-like gene is NCU06650. 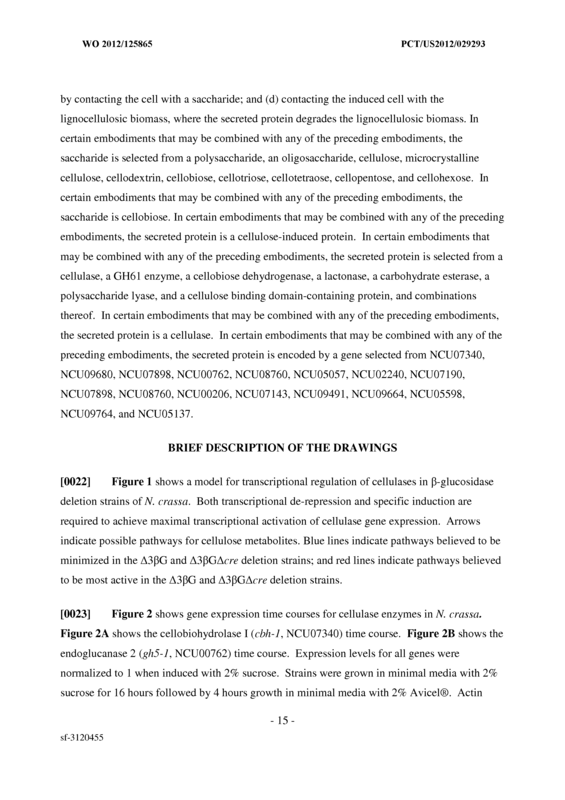 The recombinant cell of any one of claims 99-126, wherein the cell is a stable cell line or a transiently transfected cell. 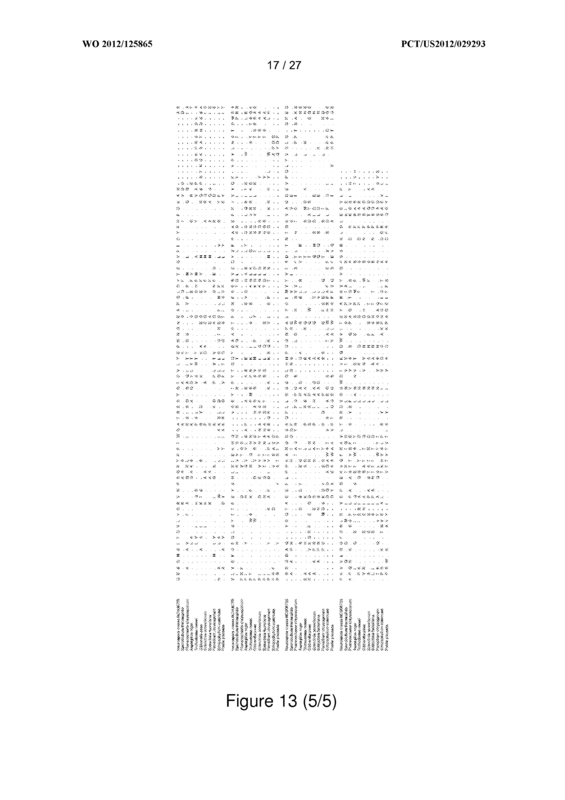 The recombinant cell of any one of claims 99-127, wherein the cell is a fungal or yeast cell. 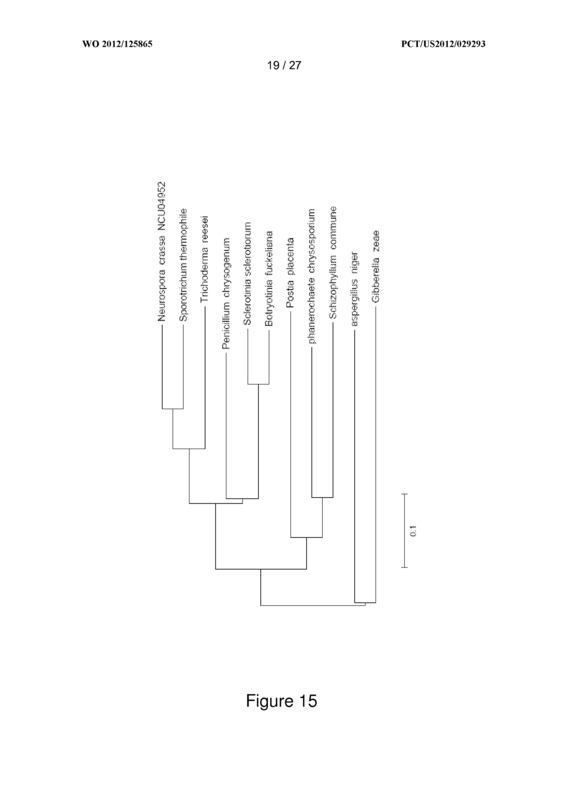 filamentous fungus of the ascomycete or basidiomycete species. 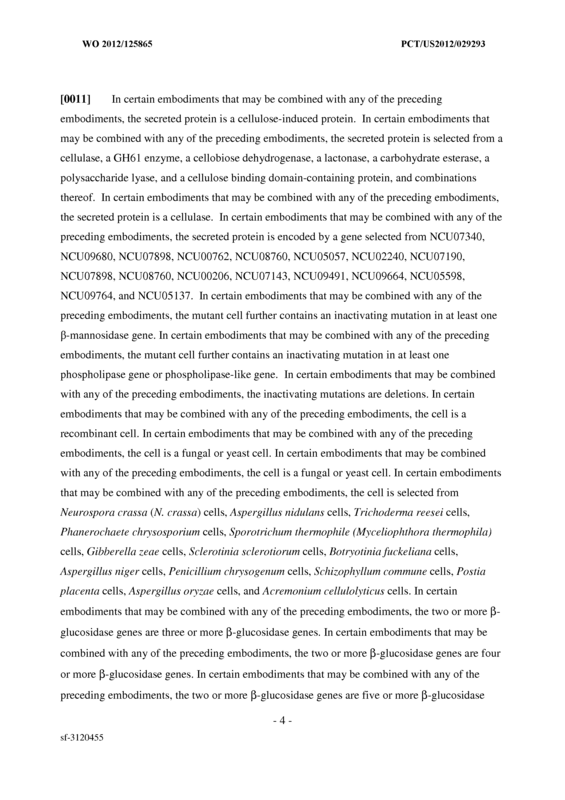 The recombinant cell of any one of claims 99-129, wherein the cell is selected from the group consisting of Neurospora crassa (N. crassa) cells, Aspergillus nidulans cells, Trichoderma reesei cells, Phanerochaete chrysosporium cells, Sporotrichum thermophile (Myceliophthora thermophila) cells, Gibber ella zeae cells, Sclerotinia sclerotiorum cells, Botryotinia fuckeliana cells, Aspergillus niger cells, Penicillium chrysogenum cells, Schizophyllum commune cells, Postia placenta cells, Aspergillus oryzae cells, and Acremonium cellulolyticus cells. 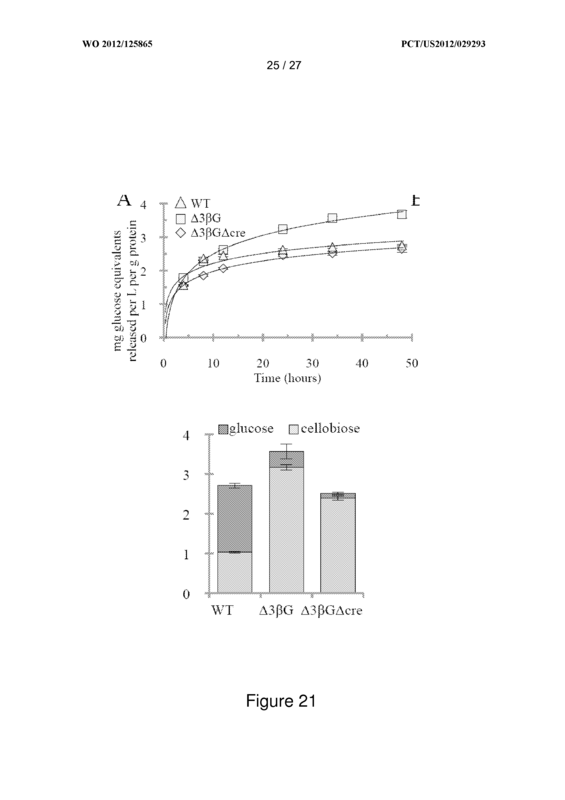 (d) contacting the induced cell with the lignocellulosic biomass, wherein the secreted protein degrades the lignocellulosic biomass. 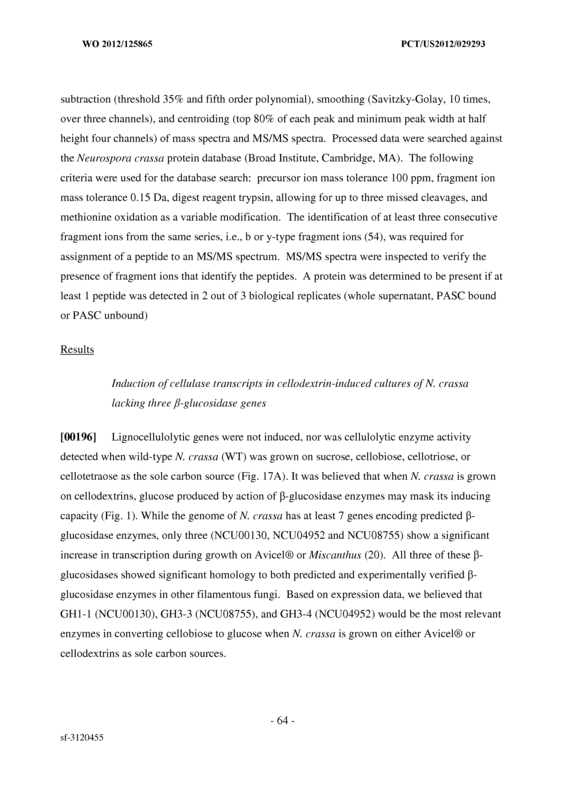 The method of claim 131, wherein the cellulosic biomass comprises one or more of a polysaccharide, an oligosaccharide, cellulose, microcrystalline cellulose, cellodextrin, cellobiose, cellotriose, cellotetraose, cellopentose, and cellohexose. 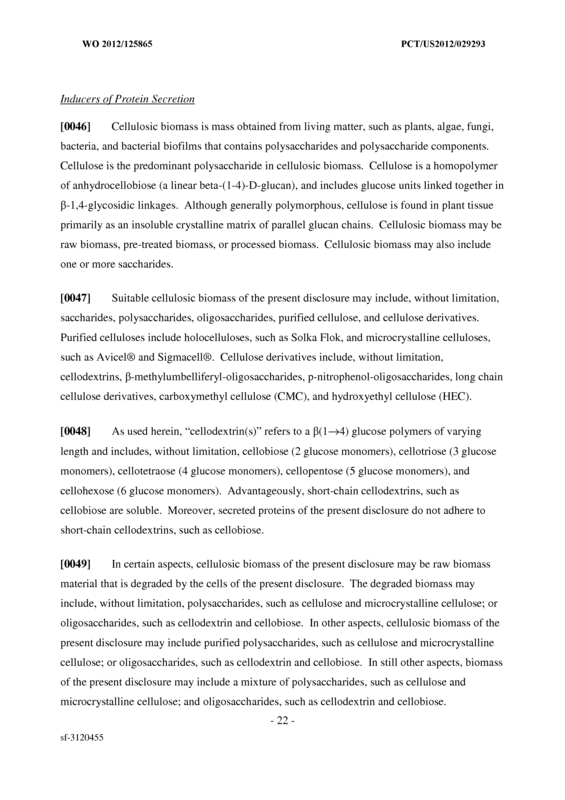 The method of claim 131, wherein the cellulosic biomass comprises cellobiose. 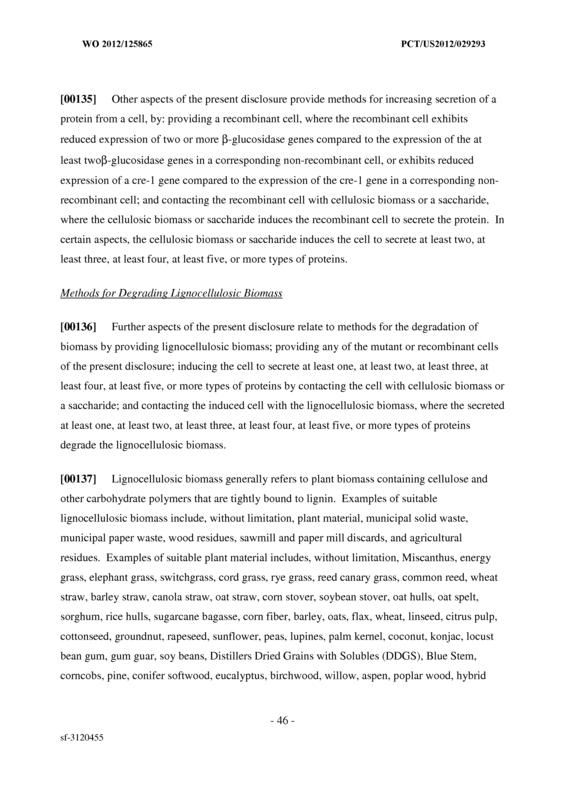 consisting of a polysaccharide, an oligosaccharide, cellulose, microcrystalline cellulose, cellodextrin, cellobiose, cellotriose, cellotetraose, cellopentose, and cellohexose. 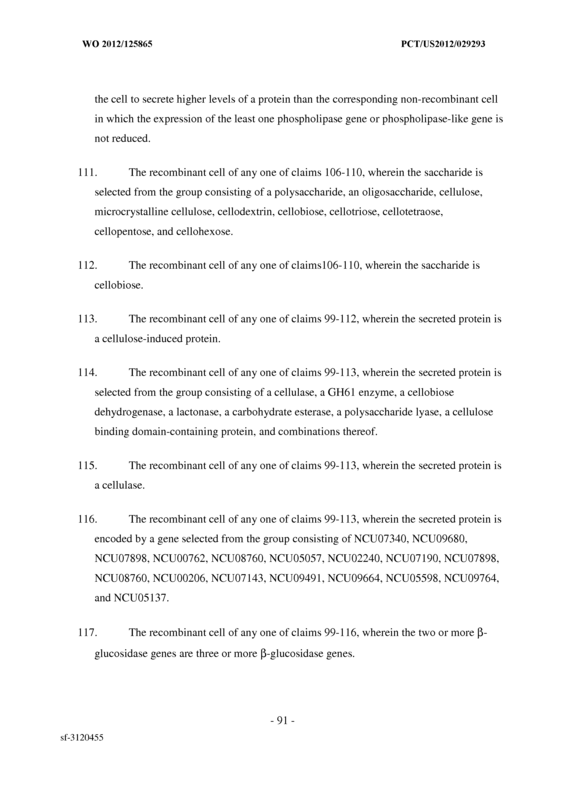 The method of claim 134, wherein the saccharide is cellobiose. 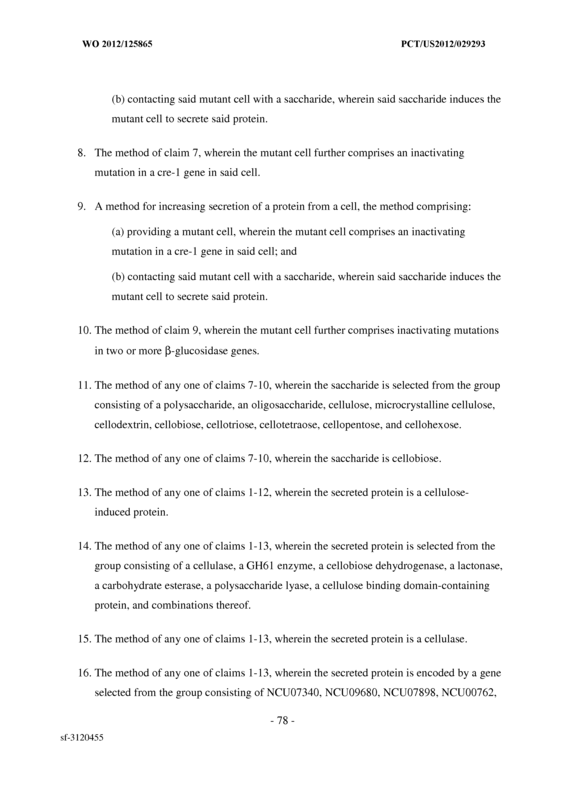 The method of any one of claims 131-137, wherein the secreted protein is selected from the group consisting of a cellulase, a GH61 enzyme, a cellobiose dehydrogenase, a lactonase, a carbohydrate esterase, a polysaccharide lyase, a cellulose binding domain- containing protein, and combinations thereof. 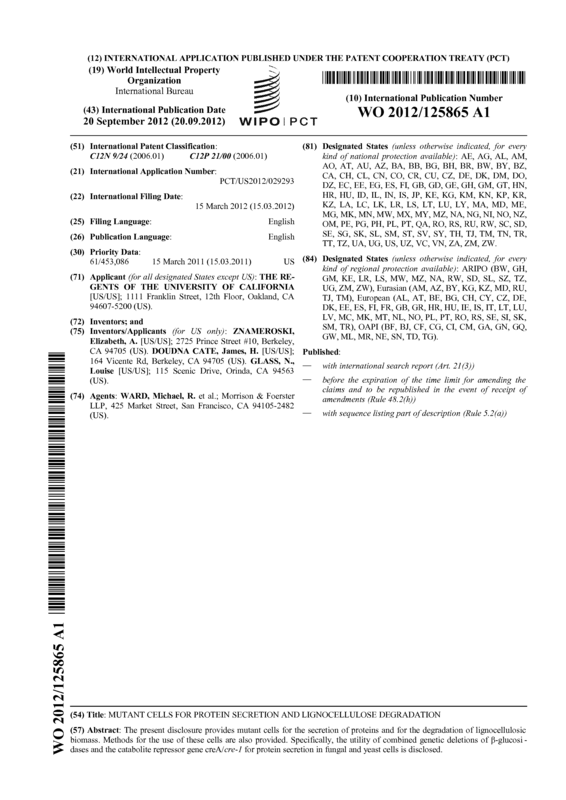 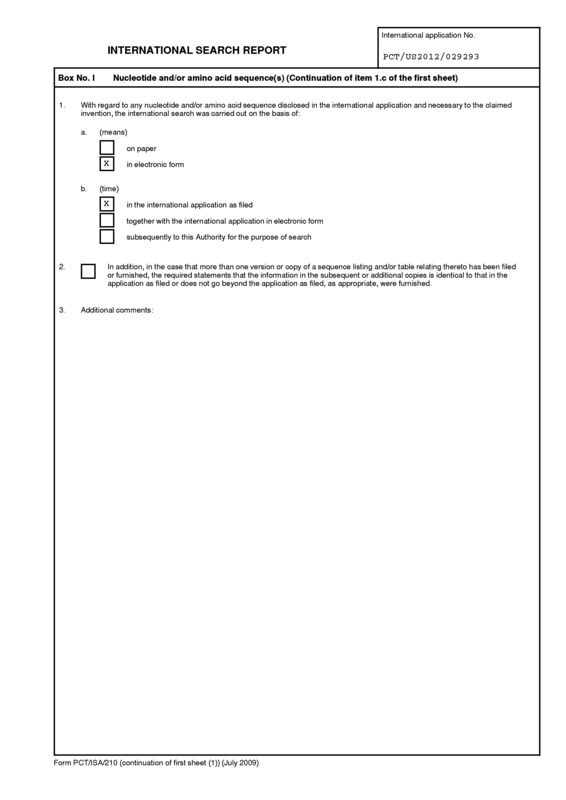 encoded by a gene selected from the group consisting of NCU07340, NCU09680, NCU07898, NCU00762, NCU08760, NCU05057, NCU02240, NCU07190, NCU07898, NCU08760, NCU00206, NCU07143, NCU09491, NCU09664, NCU05598, NCU09764, and NCU05137.